USMC CAPTAIN, US NAVY LT. 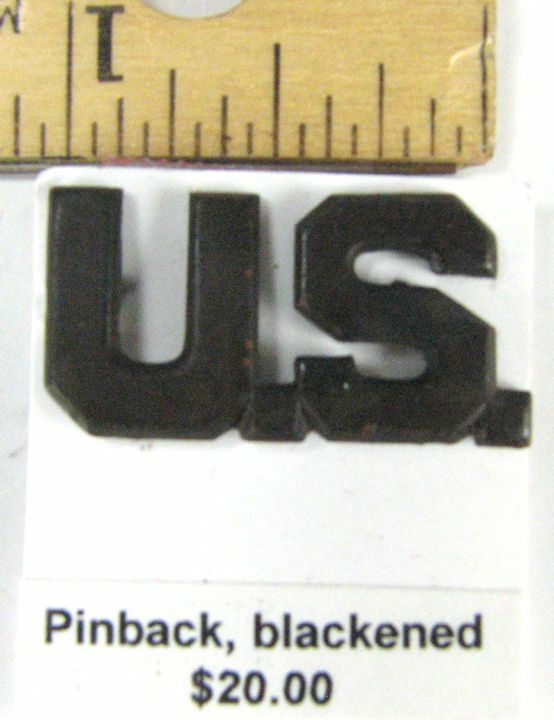 BARS: Pinback, not marked. 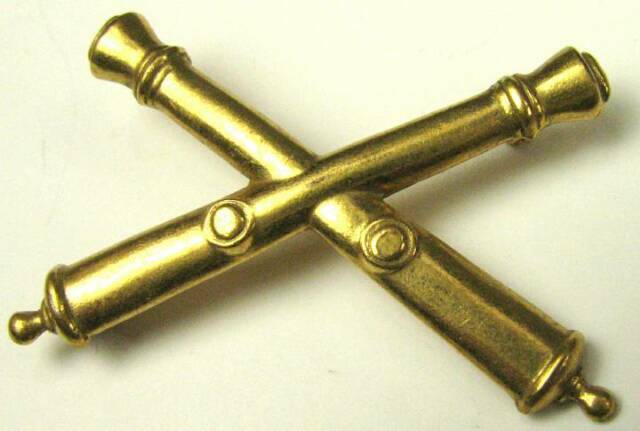 Appear to be brass. Pair. 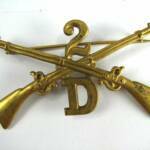 Signal Corps: Enameled. Single piece. Clutchback. Snowflake back marked ACID TEST. Includes two nuts. 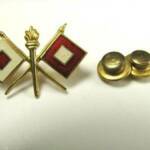 Field Artillery: Officer's collar insignia. Used 1907-1926. Single piece. Pinback. Unmarked. 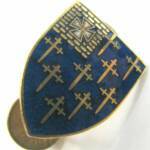 Pre-WW1 Collar Insignia: 20th Infantry, Company F. Pinback, unmarked. Circa 1905-1917. WW2 Dental Corps (Gold): 4 piece matching set. Marked BALFOUR, 1/20 10K GF. These are Gold fill. Only 4 nuts. 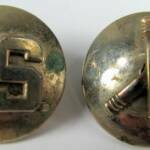 WW1 Lt. Bar: Pinback, marked STERLING. Measures 3/4" X 3/8". Single piece. 2 1/2" Senior Pilot Wings: Age unnknown, possibly Vietnam. Subdued finish. Unmarked back. Clutchback and the nuts are included. 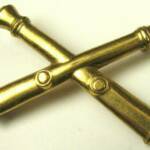 Air Defense Artillery Collar Pins: Clutchback with the nuts. Unmarked backs. Subdued finish. 5th ARMORED PATCH and LAPEL/COLLAR DISKS: I believe these to be from the Korean War era. Clutchback. 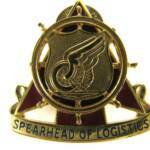 Spearhead of Logistics: Transportation Corps Distinctive Insignia. Includes two nuts. Marked S-38, MADE IN USA. Both nuts included. 10th Infantry Pin: Both studs and nuts included. Marked N.S. MEYER. 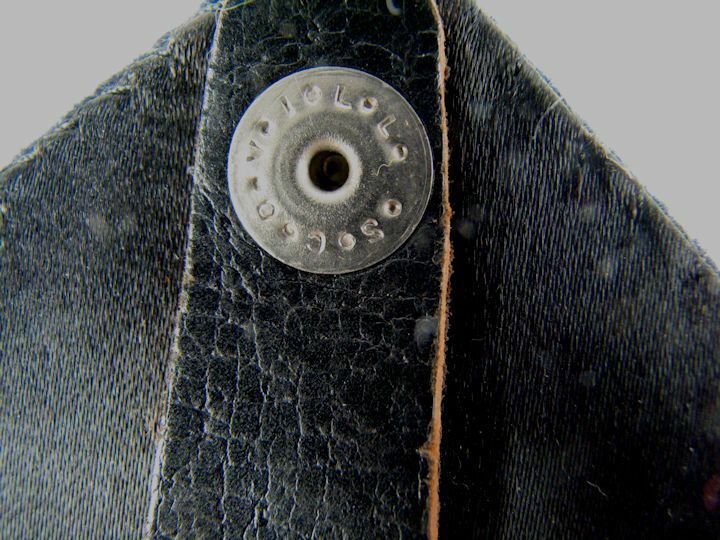 1930's Enlisted Hat Device: Screwback. 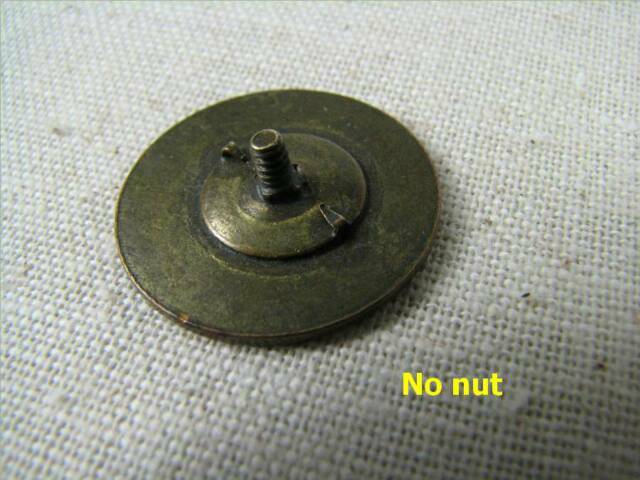 WWI Collar Disk: No nut with it. 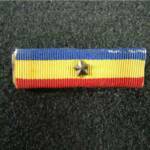 Army, 3 ribbon bar: Good Conduct with 3 stars; Navy Sea Service and American Defense. I need to photograph it again if you are interested. USMC/NAVY, Presidential Unit Citation: The award with the star for the vet who was there. Slight edge wear as shown. 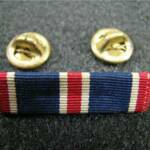 Air Force Outstanding Unit Citation Ribbon: Clutch back with the nuts. 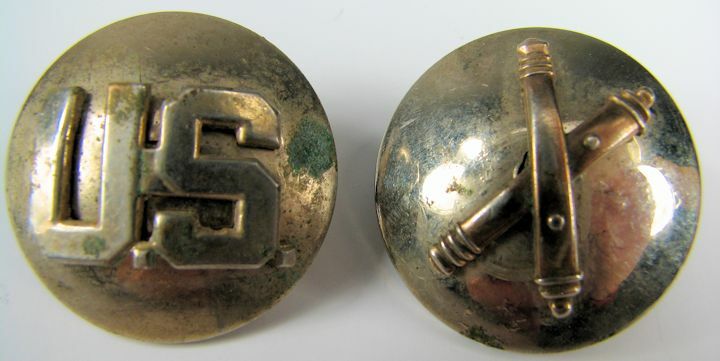 WW2 ARMY-NAVY Production Award: Marked "STERLING". Measures about 7/8" long. Pinback. 2 avail. @ $5.00 ea. 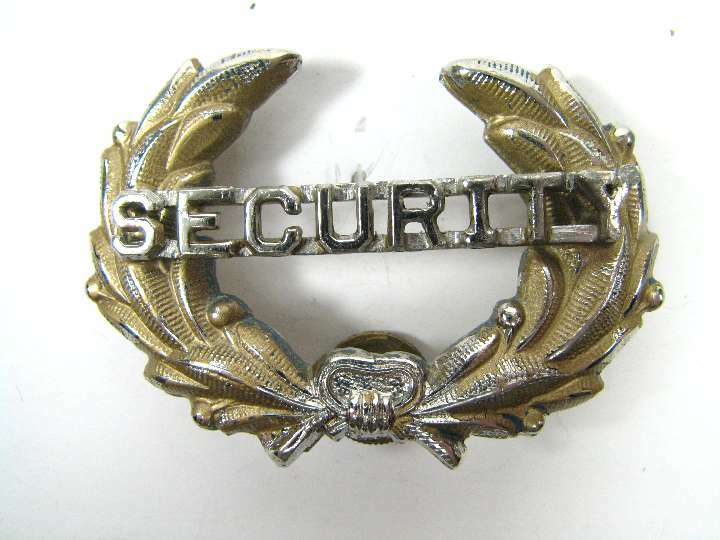 Old hat "SECURITY" badge: Classic wreath style hat pin or badge for a guard. Screwback with nut. Age unknown and it is unmarked. 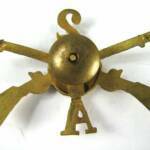 DOMED SILVER COLORED ARTILLERY INSIGNIA. Two piece construction with clutchback nuts. Needs cleaned. 211th, First Corps Cadet Mass, N.G. Artillery. WW2 DUI. Quite a history online about this unit. Screwback. 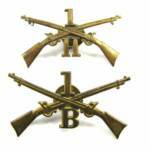 1902 HOSPITAL CORPS Collar Insignia: One pair of 1902 Collar devices for Hospital Corps. Not marked but look to be silver or silverplate. Screwback with original nuts. Measures about 7/8" wide. 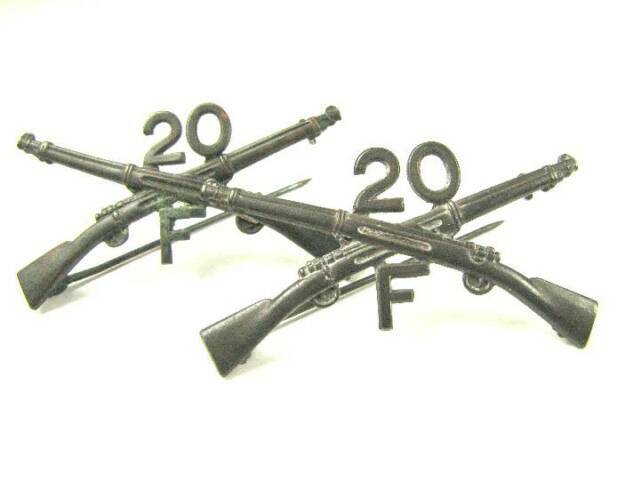 Nice Philippine War items. 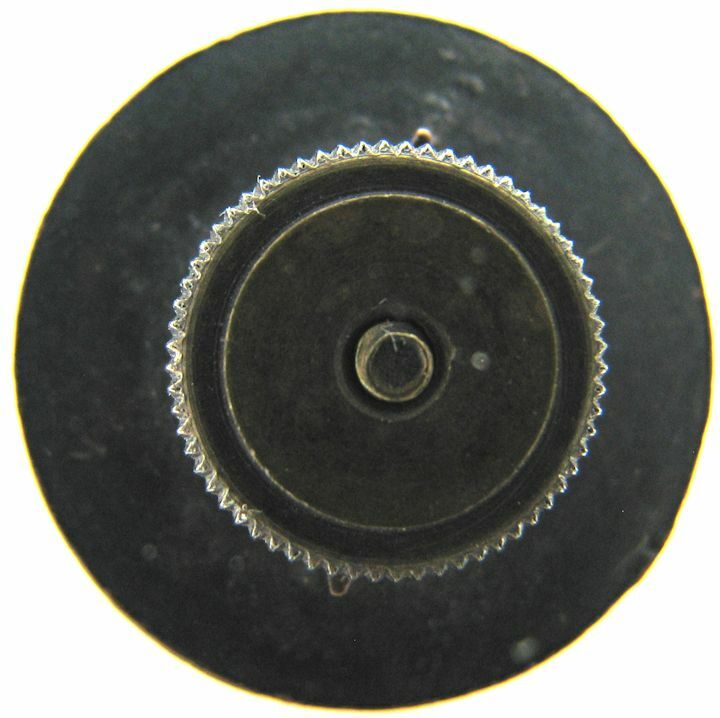 MODEL 1896 Hat Device, New York N.G. : The 71st New York was in CUBA with Teddy Roosevelt at San Juan Hill. It is the 1896 pattern and measures 2 1/2" wide. It is screwback. 71/L has the prongs bent over. 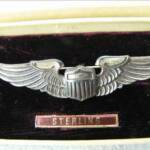 STERLING, U.S. ARMY SENIOR AIR CREWMAN WINGS: One nut included. Marked SIMON G1 STERLING. Measures 2 5/8" wide. Probably Vietnam War? BOXED. 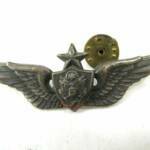 AMICO, STERLING, WW2 PILOT WINGS: 2 inch Shirt size, AMICO, STERLING in original AMICO box. Hard to find in the original box. The box lid has two corners that have splits. 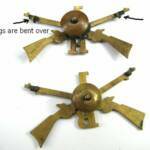 WW1 Signal Corps Disc: Correct disc for early Aviator or Signal Corps. Screwback missing the original brass nut. 2nd Air Defense Artillery Regiment DUI: Some red paint loss and wear to the eagle. Pinback. Not marked on the back. 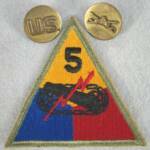 66th ARMORED REGIMENT DUI: Marked on back N.S. MEYER. Some scuffs to the front and pins are bent a little. Clutchback, nuts included. 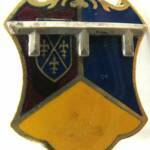 34th INFANTRY REGIMENT DUI: Nice one. Clutchback with nuts. Marked on back Martin Kahn 6K. 9th ENGINEER Bn. DUI: Marked on the back "P-23, Made in USA". Clutchback and includes BALLOU nuts. Slight bending of one pin. 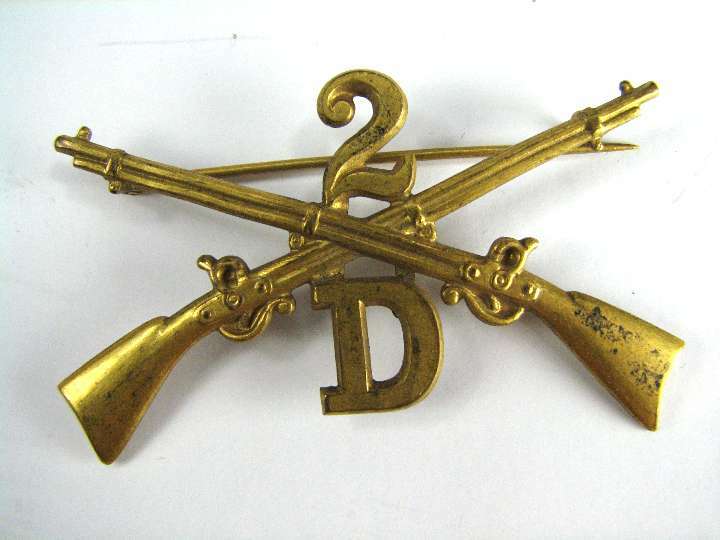 1902 Collar Pin, 2nd Infantry, Company D: Very nice single pin back collar device for the 1902 standing collar dress tunic. Measures 2 1/4" wide. No problems. 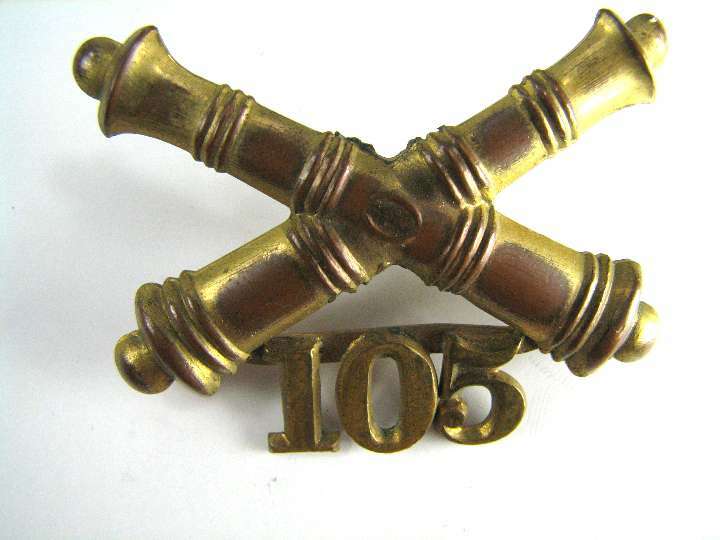 1896 Pattern Hat Device, 105th Artillery: Screwback (no nut with it). Measures 2" wide. 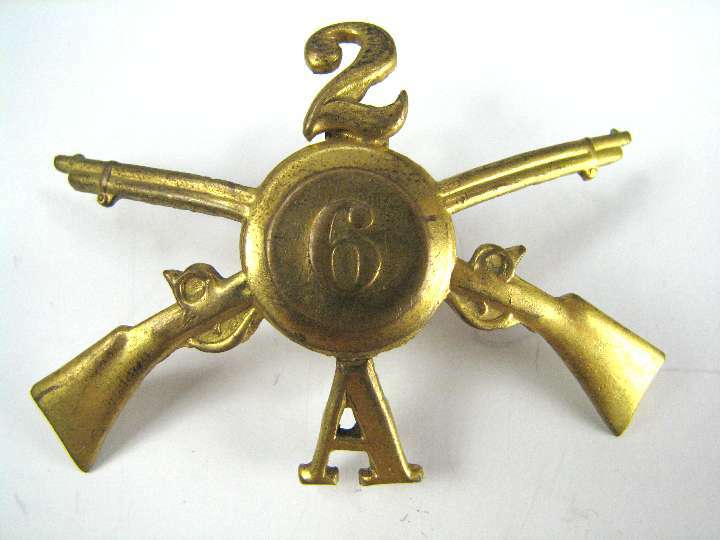 1902 Hat or Collar Device, 2nd New York Infantry, Company A, Soldier 6: Screwback complete with nut. Measures about 2 1/4" wide. 2nd Lt. 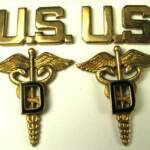 Shoulder Boards: I believe these are fairly recent and are for a 2nd. Lt. in the Engineers or perhaps Ordnance. I see no maker name on them. I see no problems with them. One pair. 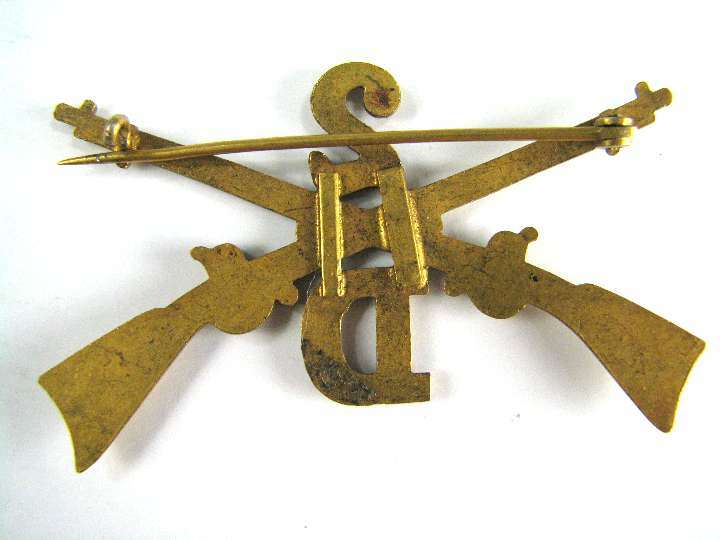 MUSICIAN'S HAT BADGE: Measures 2 1/2" X 1 3/4" in size. Screwback. studs are present. ROTC UNIFORM SET: By N.S. Meyer. 11 pieces In original box. WW2 D.E.M.L. 1937-1942: "Detached Enlisted Men's List". Screwback. 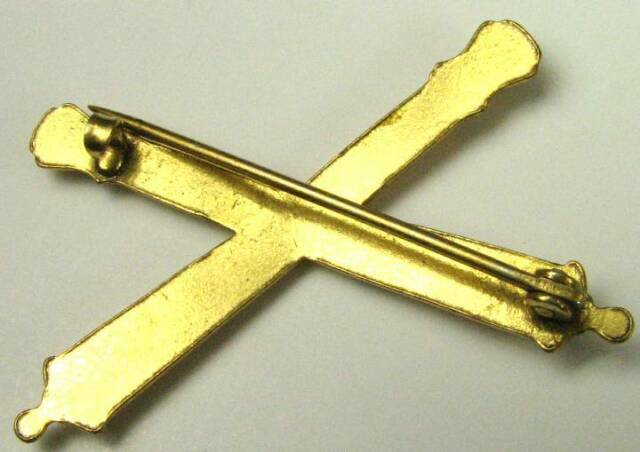 Collar/lapel device. 1" diameter. 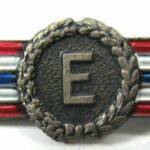 CORPS OF ENGINEERS COLLAR DISCS: One pair on the original card. Clutchback. 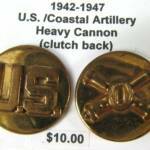 COASTAL ARTILLERY COLLAR DISK SET: "Heavy Cannon". 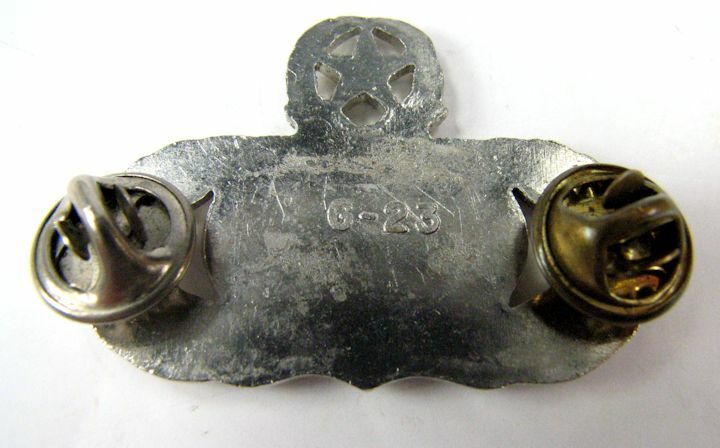 CORPS OF ENGINEERS COLLAR DISK SET: Clutch back. 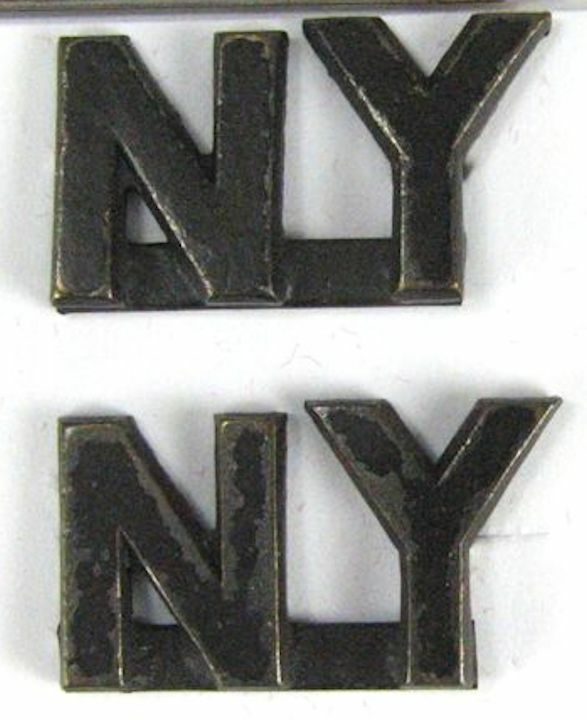 New York National Guard collar insignia. 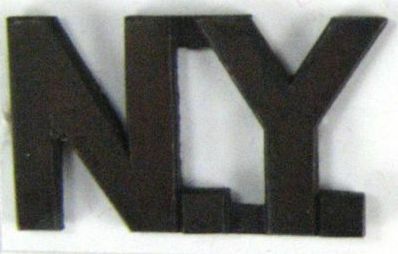 Type used 1923-1947.PIN BACK! 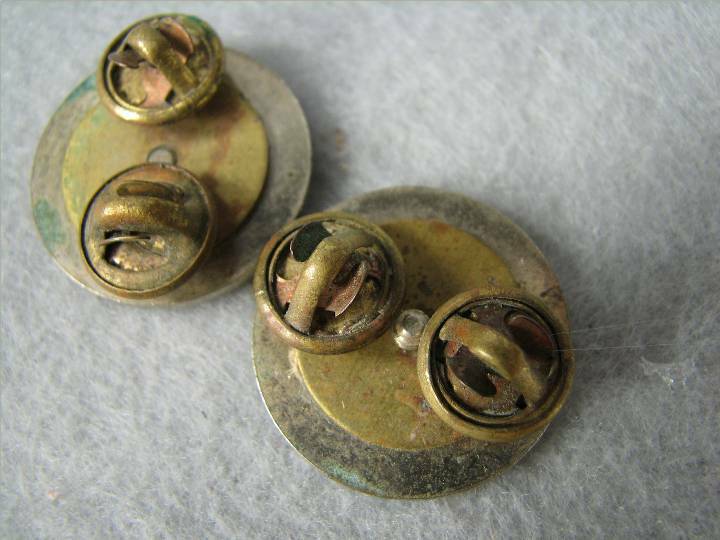 EARLY WW2 QUARTERMASTER COLLAR DISK SET: Screw back. 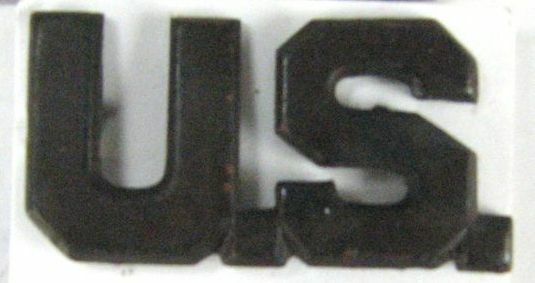 Type used 1937-1942. 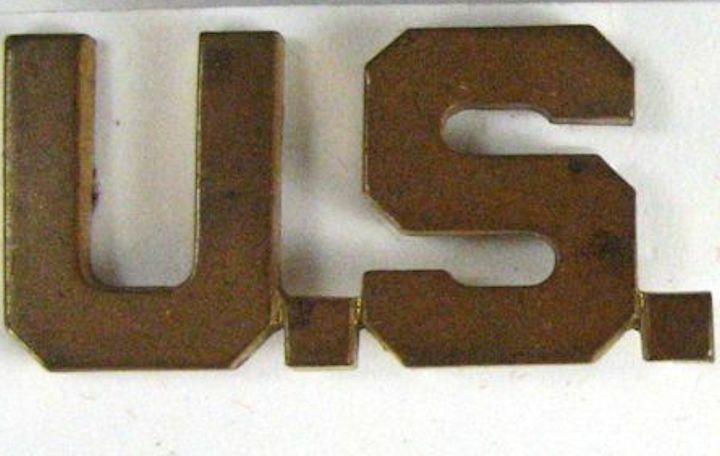 WW2 U.S. COLLAR DISK: Screw back. 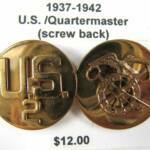 EARLY WW2 QUARTERMASTER COLLAR DISK: Screw back. WW2 SERVICE COMMAND DUI: Pin back. 2nd pattern. Marked STERLING. Made by GEMSCO. 1930's C.C.C. 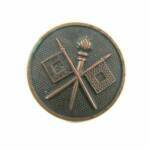 PIN: Single pin from Civilan Conservation Corps. 1 1/8" X 1/2" size. Pinback. Hard to find item. 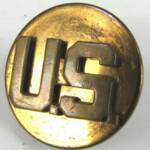 1902 COLLAR U.S. PIN: Brass color with early pinback fastener. Single pin. About 15/16" X 1/2" in size. 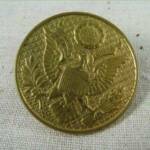 1/2" size probably dates it 1920's-WW2. UNIFORM HAT DEVICE: For the International Order of Odd Fellows. About 2" X 2", Screwback. Old. 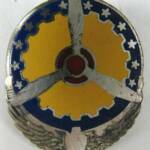 U.S. AIR FORCE MAINTENANCE & MUNITIONS BADGE: Measures 1 5/8" X 3/4". Clutchback with nuts. WW2, U.S. PUBLIC HEALTH OFFICER'S HAT PIN: 17.9 grams STERLING silver. 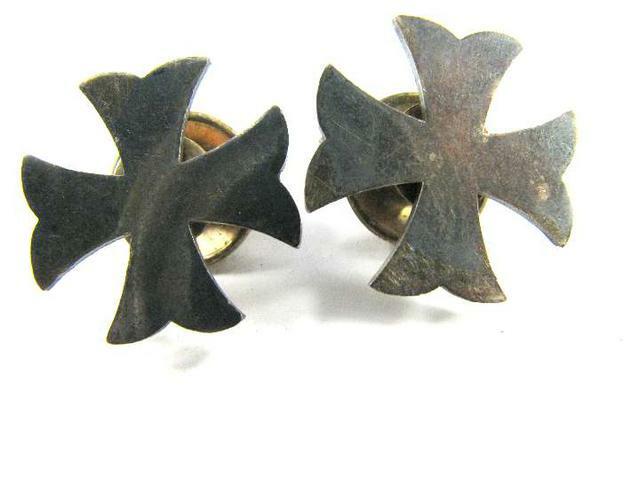 Hallmarked on the back: "Blackinton Sterling". The hallmark is weak and blurred but it is there. Size of pin is 2" X 2". It has a pinback fastener. WW2, SHOULDER BOARD, NAVAL AVIATION CADET: Hilborn & Hamburger maker label. Bullion star with one thread damage. See the photos for more information. 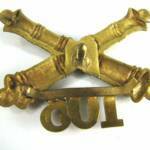 EARLY, ARMY OFFICER'S HAT PIN: I believe this to be an early pin with the oval cloud. Appears to be cast and not stamped judging by the back surface. 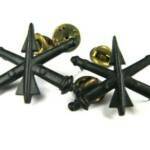 The two anti-rotation studs are lower than usually seen, these being on the olive branch and arrows. Wing tips are bent slightly forward for hat wear. Not hallmarked. Screwback with the nut. Size is smaller 2" X 2 1/4". Nice pin. U.S. AIR FORCE MASTER INFORMATION MANAGEMENT BADGE: Marked G-23 on the back. With nuts. 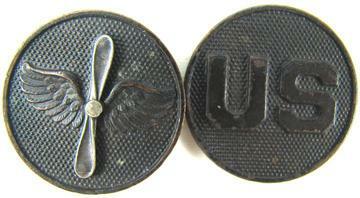 1902 COLLAR PIN: Blackened, Pinback. 5/8" X 1-3/16". 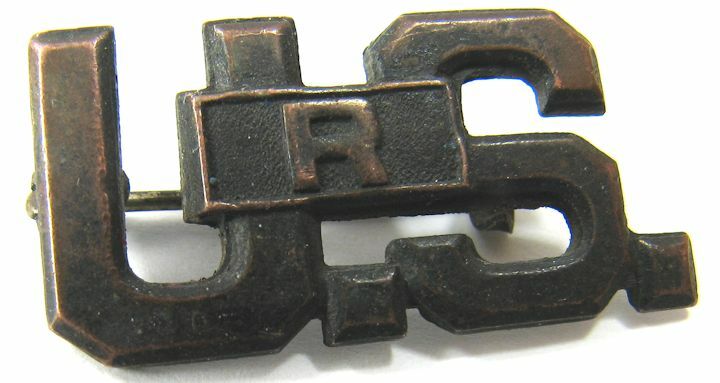 Type used approximately 1905-1923 on standing collar tunics. One piece construction. 5/8" high dates it 1902-1920's for the standing collar. It is pinback. 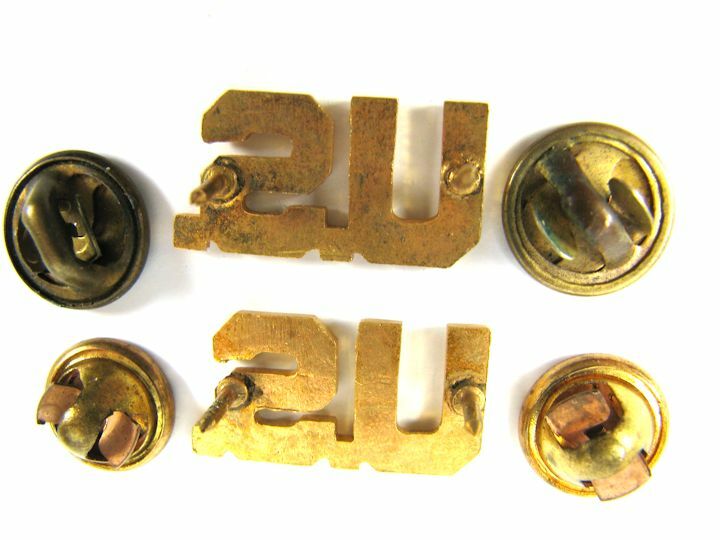 These date early since the letters are soldered to a bar and the backs have loops for sewing to the uniform instead of using a pin. 5/8" high, blackened surface has wear. New York Nat'l Guard. 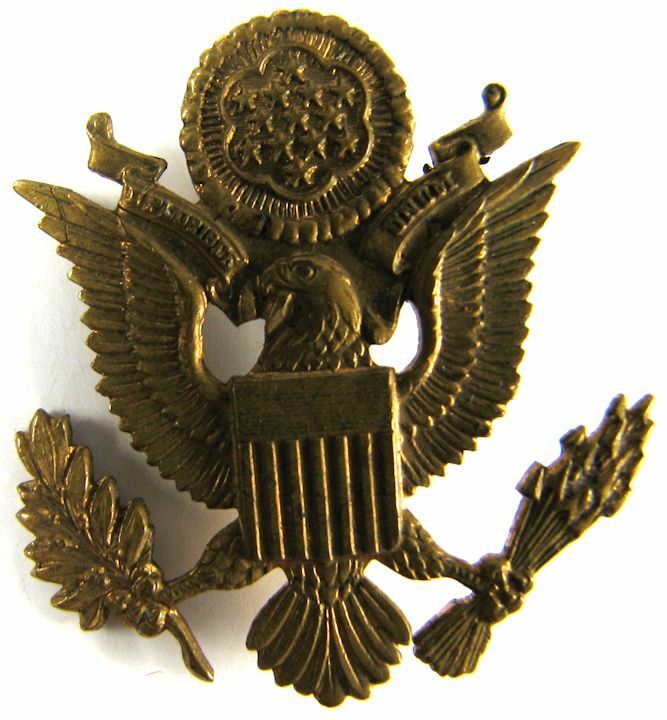 1902 U.S. COLLAR PIN, BRONZE: One piece, bronze finish, pinback fastener. 5/8" X 1-3/16" in size. Type and size used 1905-1923 for standing collar tunics. 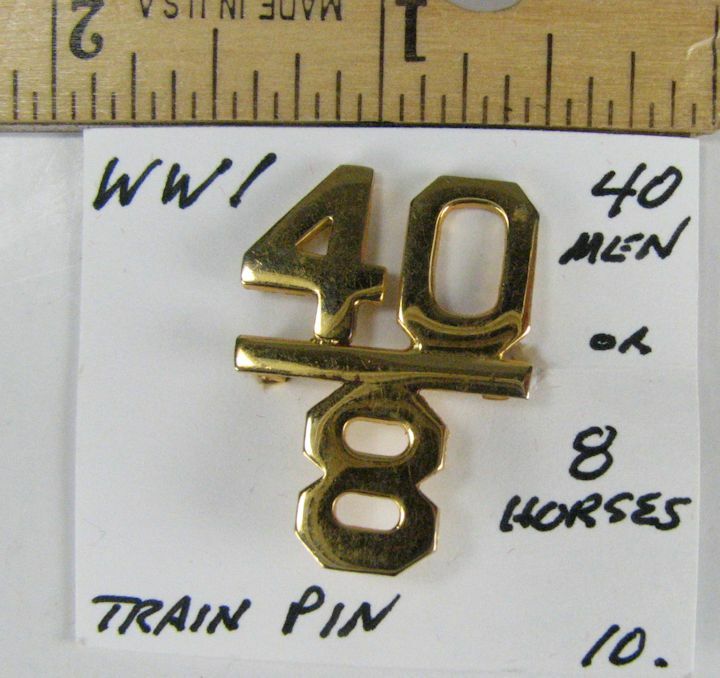 WWI TRAIN PIN: Logo stood for a train car that would hold 40 troops or 8 horses. 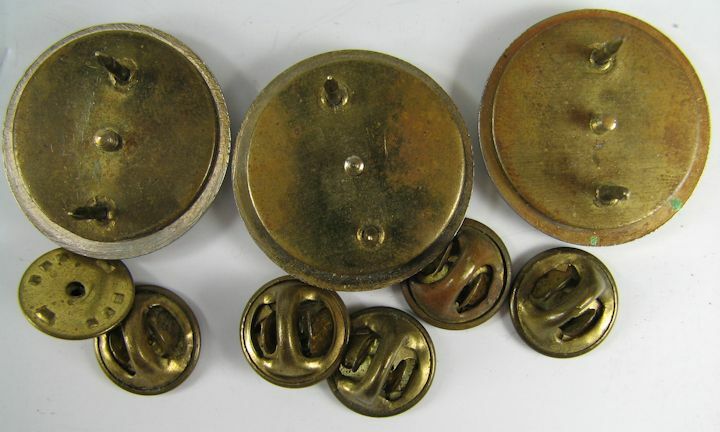 7/8" X 1- 3/16" with a Pinback fastener. 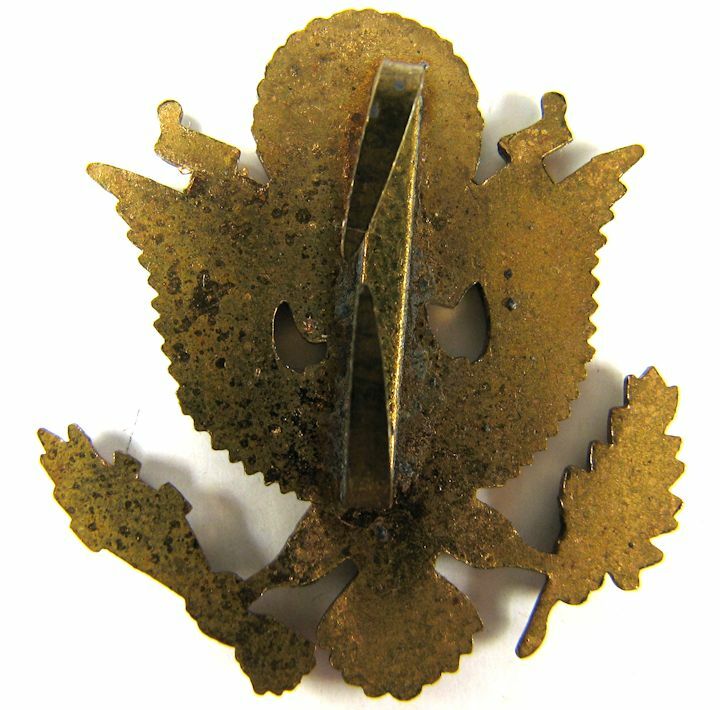 U.S. NAVY SCUBA DIVER PIN: Clutchback fasteners. Measures 1" X 15/16". Hallmarked on back "DEC 15-81". ARMY TRAINING: I have in my notes that these are Army Training Insignia? 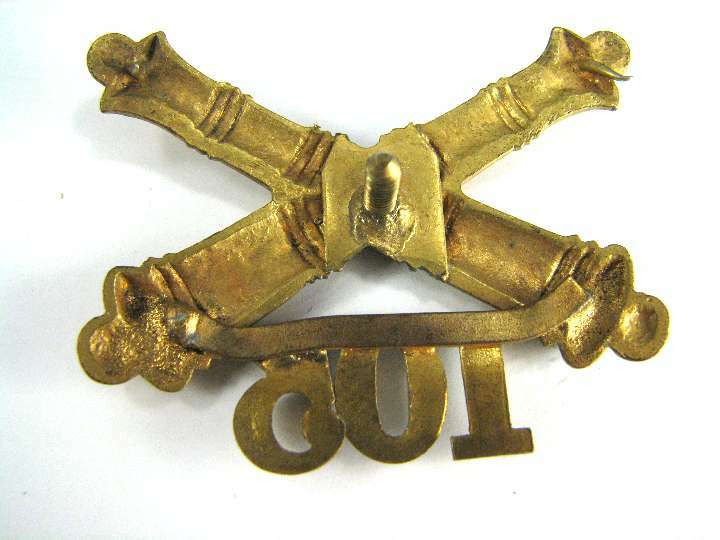 OLD ORDNANCE PIN: Nice condition, clutchback. Measures 1" high. 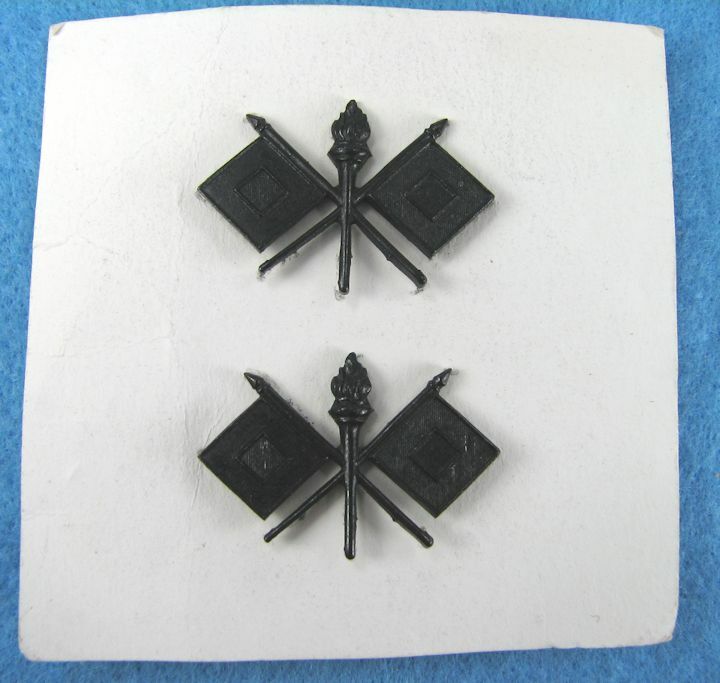 OFFICER'S SIGNAL CORPS, Dated 1969: 1 pair of subdued insignia on the original card. Vietnam era. 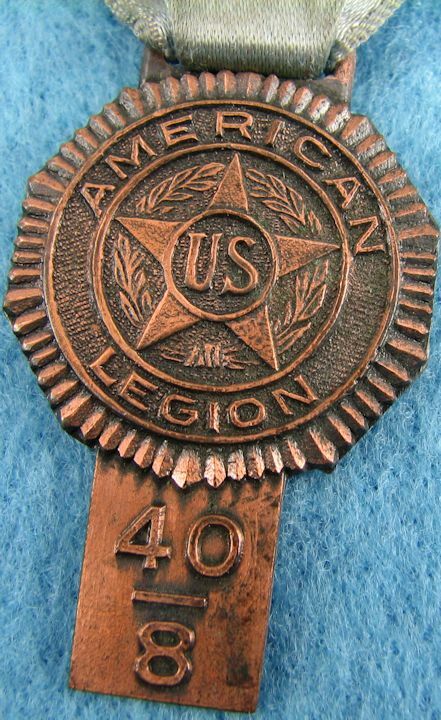 WW1 TRAIN CAR, 40/8 PIN/RIBBON: This 40 troops/8 horses medal is from a 1947 assembly in St. Louis. Top pinback missing. Nice pendant. Writing on ribbon has faded but is still readable. 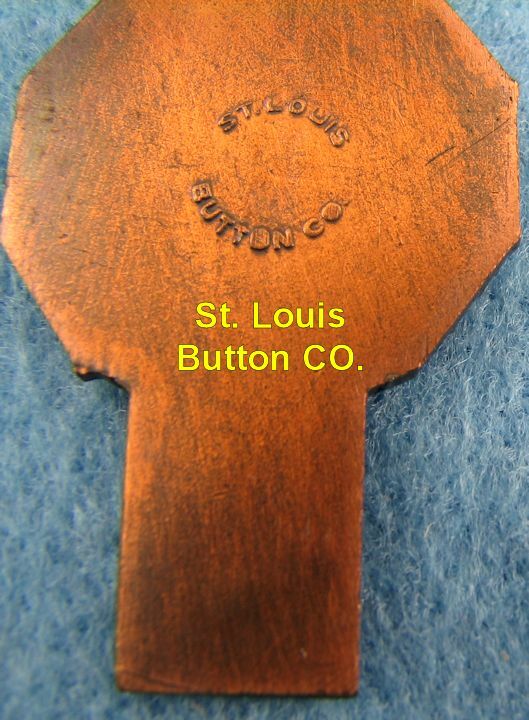 Made by St. Louis Button Co.
WW1 MEDAL FOR TRAIN CAR THAT WOULD CARRY 40 DOUGHBOYS or 8 HORSES: Nice image of what the train car looked like. Piece of tattered ribbon on it. Pendant is nice. Maybe it could be used as a watch fob? OLD PINBACK ORDNANCE PIN: No problems with this nice pin. 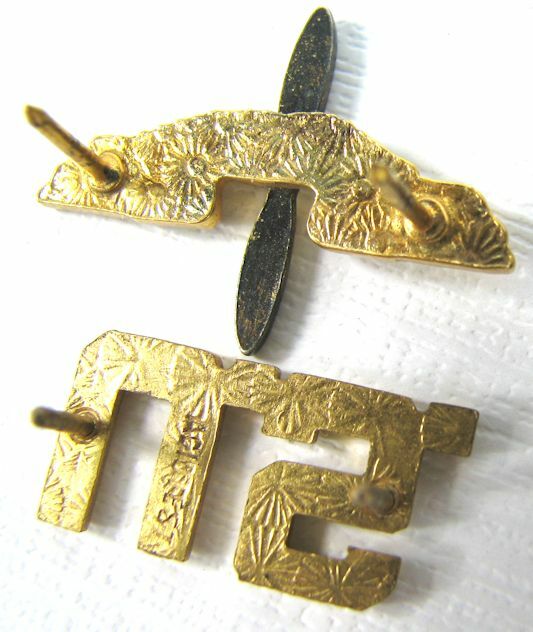 MATCHED PAIR, U.S. COLLAR PINS: Clutchback. 1/2" X 3/4". Gold tone finish. 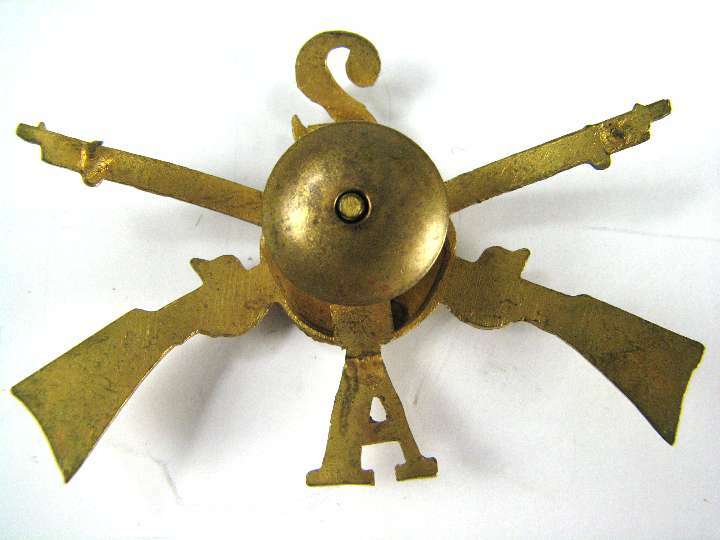 WW1 INFANTRY COLLAR DISK: Complete with the nut. Uncleaned. It has a 'blackened' appearance. I see no problems with it. 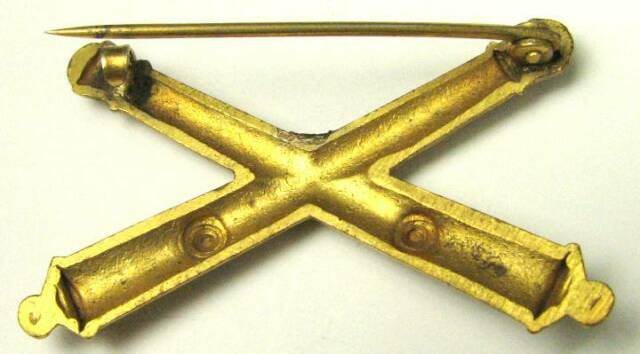 WW1 SIGNAL CORPS COLLAR DISK: Complete with the nut. Uncleaned. It is more of a bronze color than the photo shows. I see no problems with it. 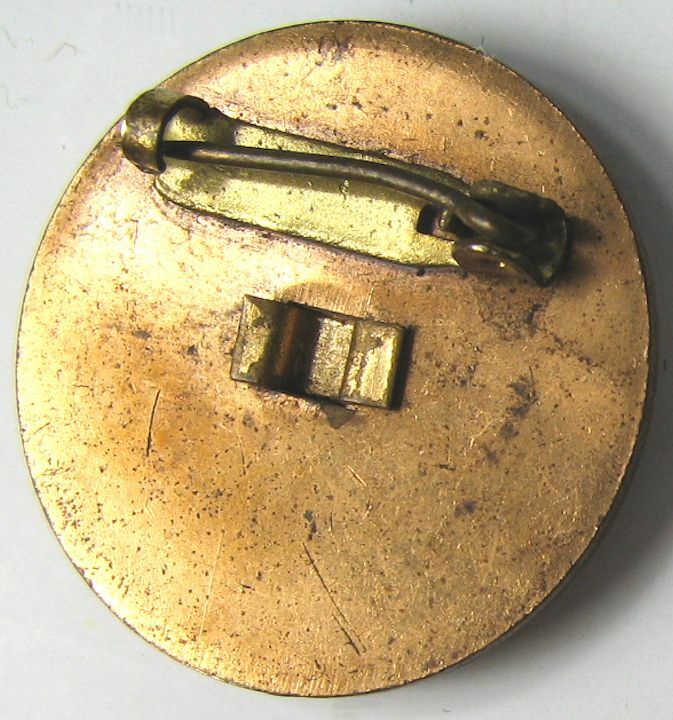 1927-1937 INFANTRY HEADQUARTERS COLLAR DISK: Complete with the nut. Uncleaned. It has a spot of corrosion on it. 1927-1937 US COLLAR DISK: Complete with nut. Uncleaned. I see no problems with it. Nice one indeed. 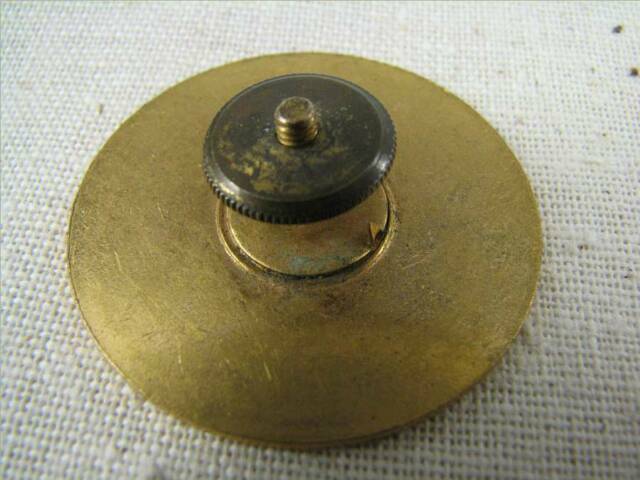 1920's QUARTERMASTER COLLAR DISK: Complete with nut. Uncleaned. It has some spots on it. 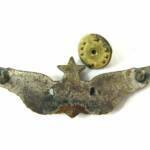 EARLY AIR SERVICE COLLAR DISK SET: Complete with matching small nuts with anti-rotation points on them. Disks are uncleaned and have a few light spots on them. Silver colored prop, 'blackened' disks. 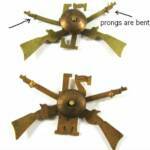 Hard to find matched set of early military aviation insignia. Nice ones. U.S. 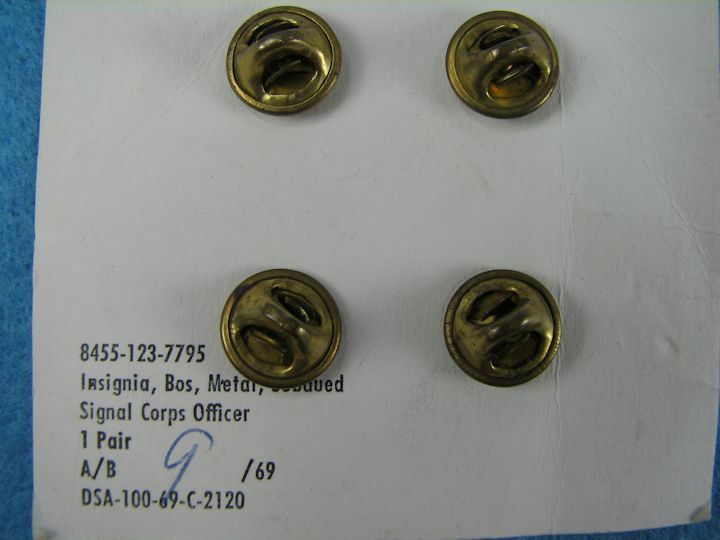 ORDNANCE COLLAR DISKS: These are flat disks made two piece with the removable insignia for polishing. I believe these will date to WW2. Dull looking and uncleaned, they may shine up? The U.S. disk has G23 on the back of it. 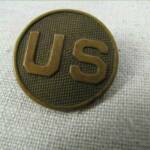 U.S. CHEMICAL CORPS COLLAR DISKS: These are slightly domed and have rolled edges. I believe they will date 1945 and later. Uncleaned and they are dull looking; may polish up? 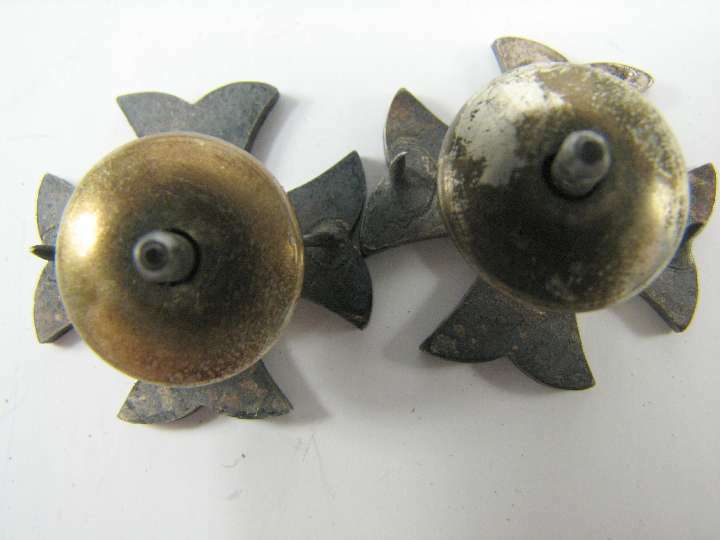 U.S. COASTAL ARTILLERY COLLAR DISKS: These are highly convex, domed and I believe they will date to the Korean War period. They are two piece so they can be separated for polishing. 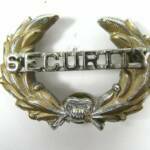 One is hallmarked GEMSCO and the othe N.S. MEYER. Pretty shiney. 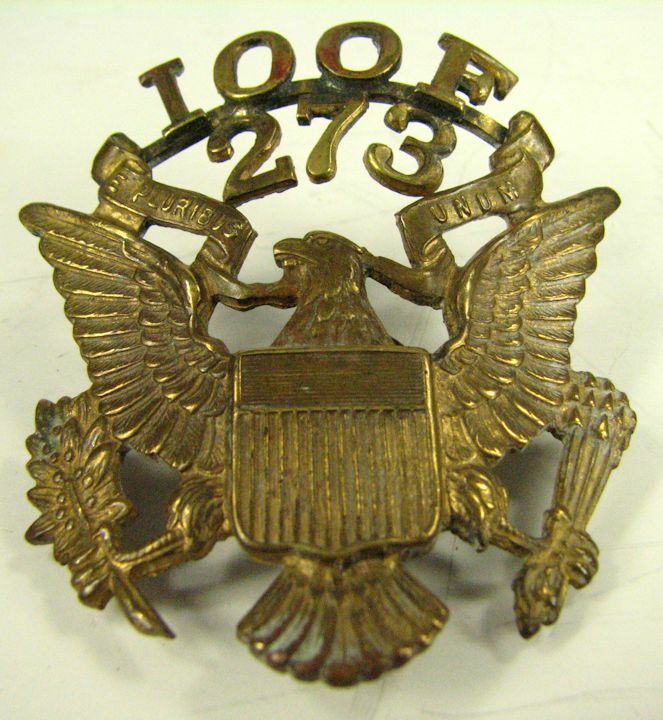 PRE-WW2 TO EARLY WW2 ENLISTED VISOR HAT BADGE: I believe this is an early style of this EM hat device due to the size of the eagle ( 1-1/4" X 1-1/4") and the oval 'cloud'. It has the nut with it but I forgot to photo it. Disc has some scratches from the eagle being rotated. It has no anti-rotation stud and never did have one. 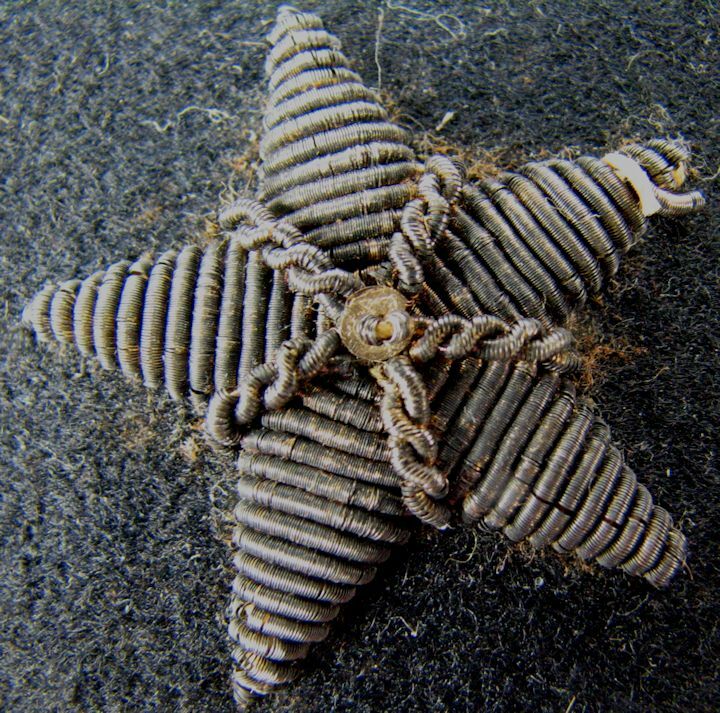 WW2 ENLISTED VISOR HAT BADGE: I date this to WW2 since it still has the early 'oval' cloud with the early star pattern It also has the larger size eagle being 1-1/4" X 1-1/4". It also has the WW2 style 'fluted' nut. There is no anti-rotation stud and never was one. Pretty nice and shiney. 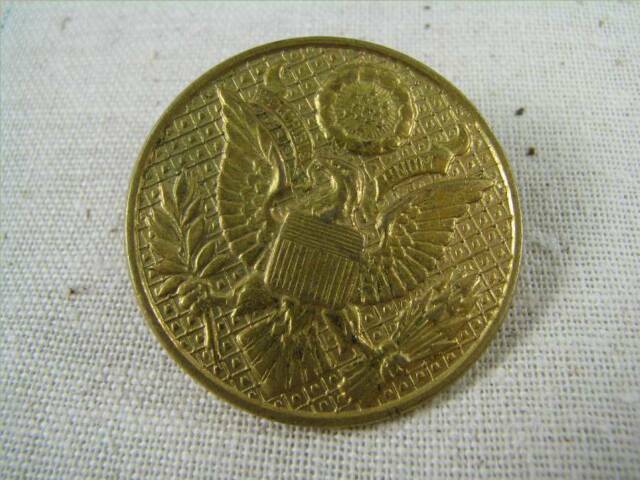 WW2 ENLISTED VISOR HAT BADGE: I believe this is WW2 due to the size of the eagle (1-1/4" X 1-1/4") and the style of the disc. The round cloud still has the earlier star design in it. 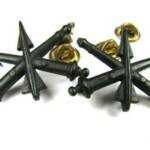 No anti-rotation stud and never was one. 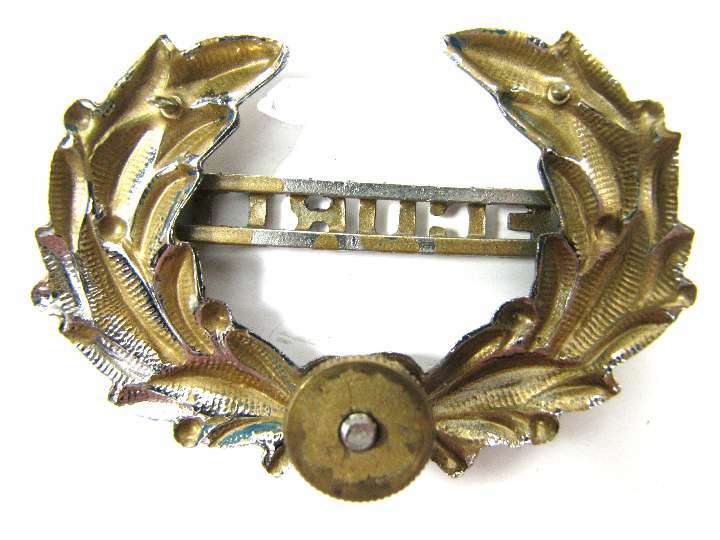 FEMALE, U.S. AIR FORCE HAT BADGE: It had a blackened or bronze finish. One anti-rotation stud. No hallmark. 1-3/4" diameter. Includes the nut. 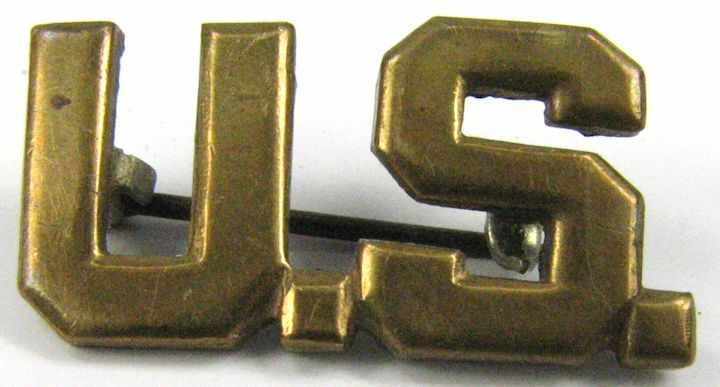 WW1 - 1923 ENLISTED HAT BADGE: Complete with nut. Blackened finish. 1-1/2" diameter. Nice one, I see no problems with it. 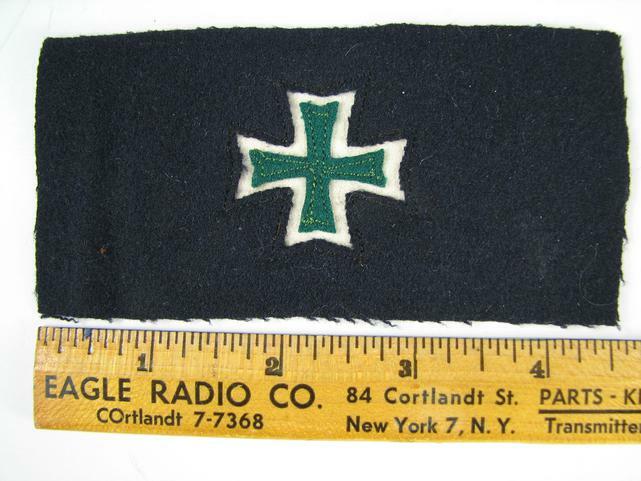 1903-1905 OFFICER COLLAR and SHOULDER BOARD INSIGNIA: I am not sure what this is but it is of the size worn only a couple of years, 1903-1905 on the uniform collars and shoulder boards. 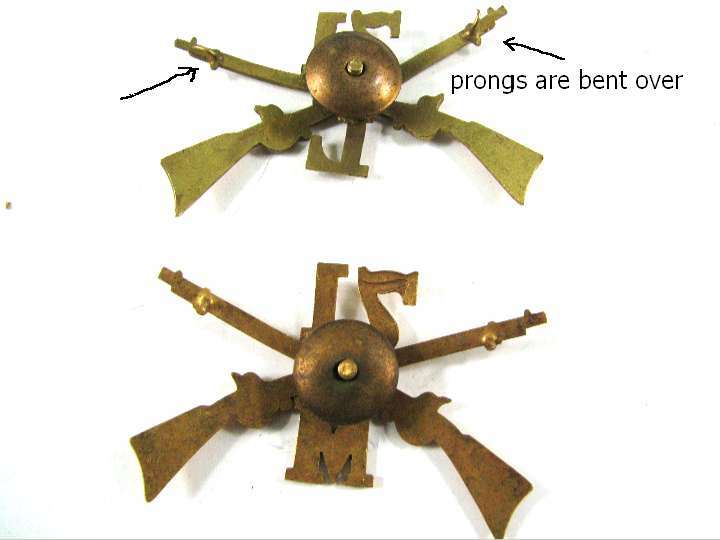 In addition to the small size the type of fastener supports this early device. Size is 1-1/8" X 1-1/4". It is flat and it is a bronze color. 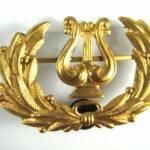 US NAVAL ACADEMY HAT DEVICE: I have in my notes that this is a hat pin used by Cadets at the U..S. NAVAL Academy. 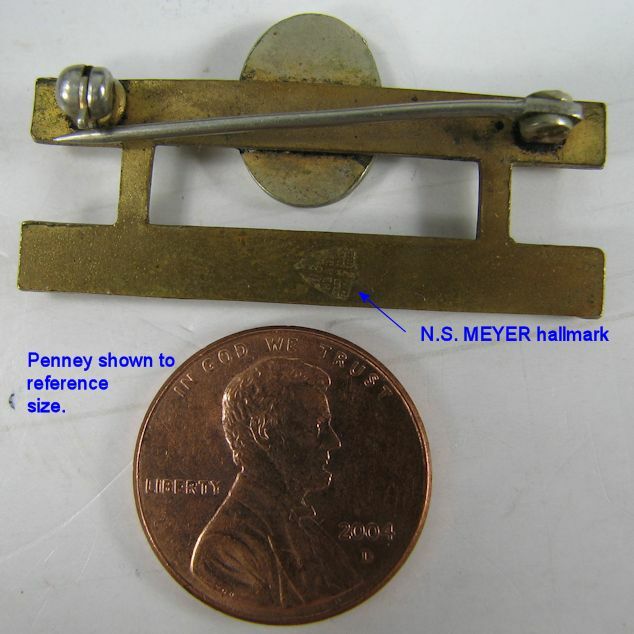 It measures 1-1/4" X 1-7/8". It may have had an anti-rotation stud at the top center but, it is now missing. It has the nut with it. WW2, AERIAL GUNNER 3" WINGS: Actually measures 3-1/8" wide. Pinback. Marked STERLING. No maker mark. 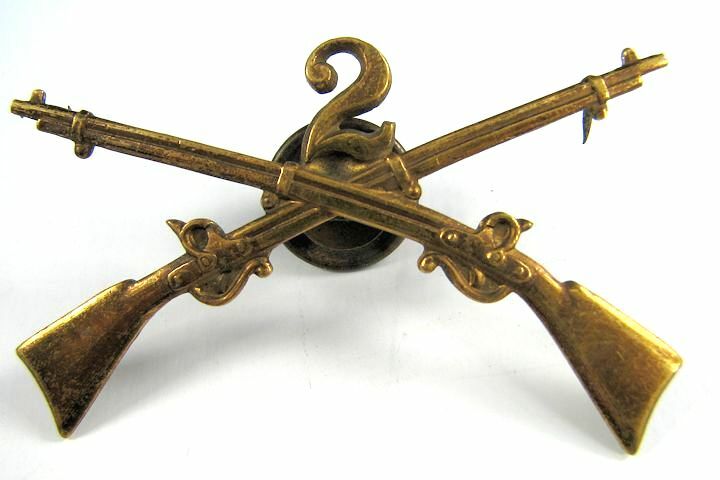 USMC RIFLE SHARPSHOOTER BADGE: Made by KREW and marked STERLING. Weighs 15.8 grams. 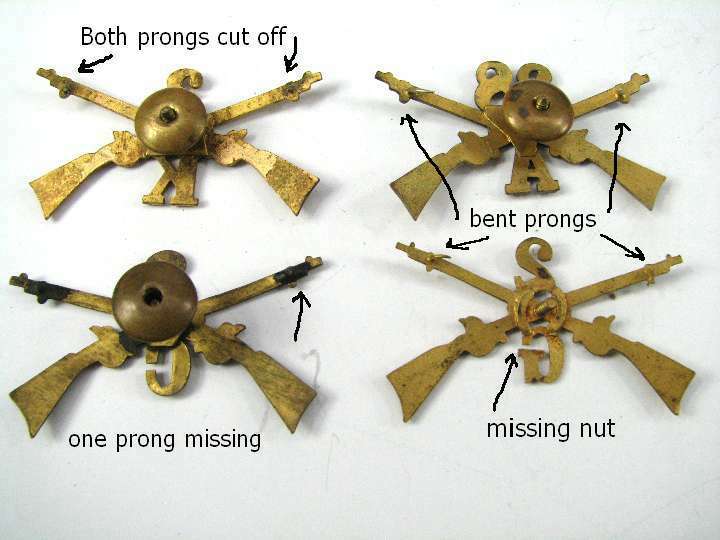 Only one nut shown in the photos but I will include a 2nd, brass nut. EGA in the center. Probably Vietnam or later period. 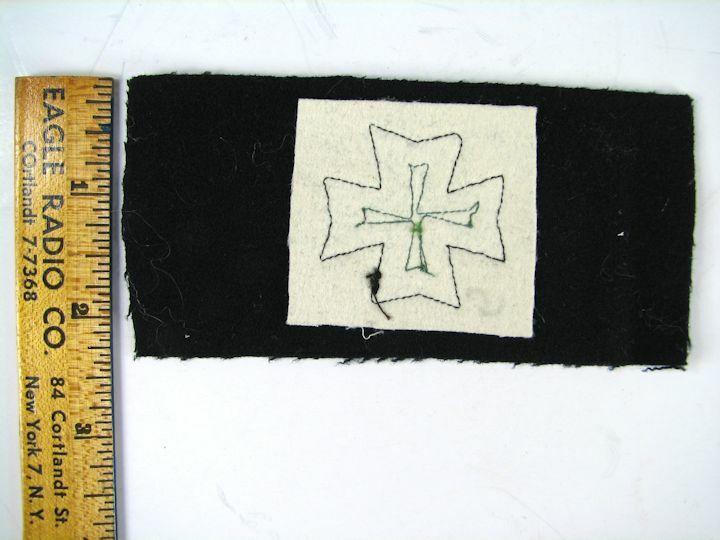 HOSPITAL CORPS INSIGNIA PATCH, 1902 PHILIPPINE WAR - Pre WW1:The construction of this Hospital Corps Insignia looks to be early 1902 pattern and could have been during the Philippine War. Nothing major wrong with it. Looks to be crudely machine sewed. 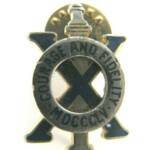 Nice early insignia. 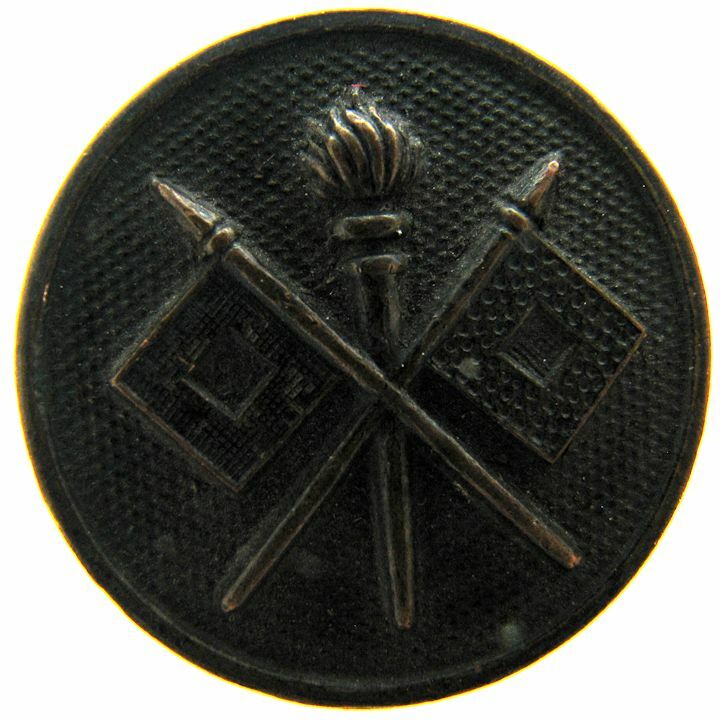 1902 COLLAR PIN, U.S. RESERVES: Blackened, Pinback. 5/8" X 1-1/4". 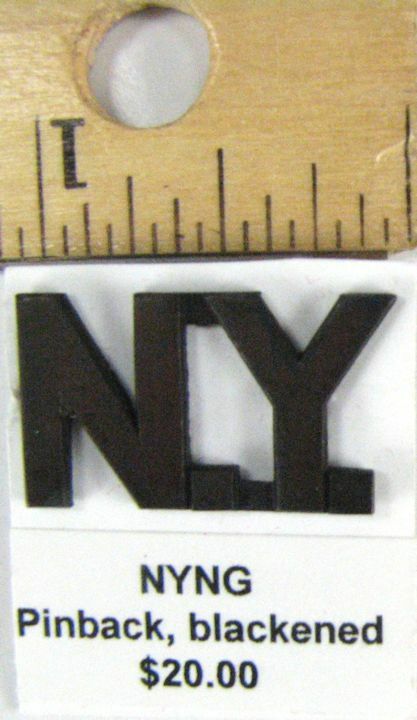 Type used approximately 1905-1923 on standing collar tunics. 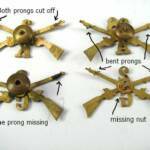 One piece construction with the boxed "R"..
"AMCRAFT ATTLEBORO MASS": SIGNAL CORPS pin for uniform lapel. Some staining of enamel which I did not try to clean. It may or may not come off. Nice maker marked on the back. 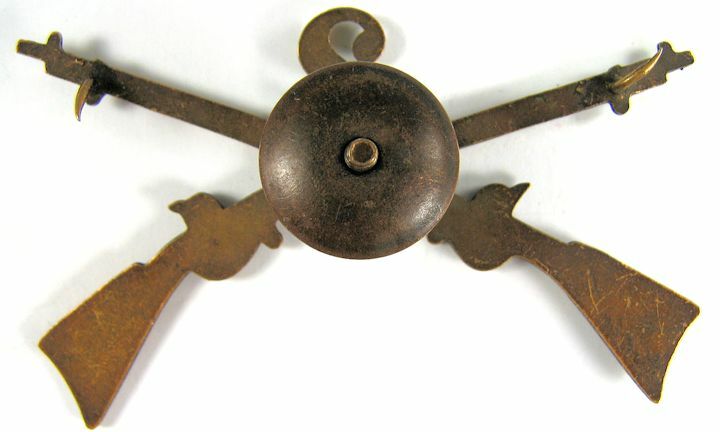 AMCRAFT SNOWFLAKE OBSERVER WINGS: Understood to be Pre-WW2/early WW2 since they are not sterling. They are marked AMCRAFT, ATTLEBORO, MASS and they have the snowflake back. 3-1/8" wide, pinback. 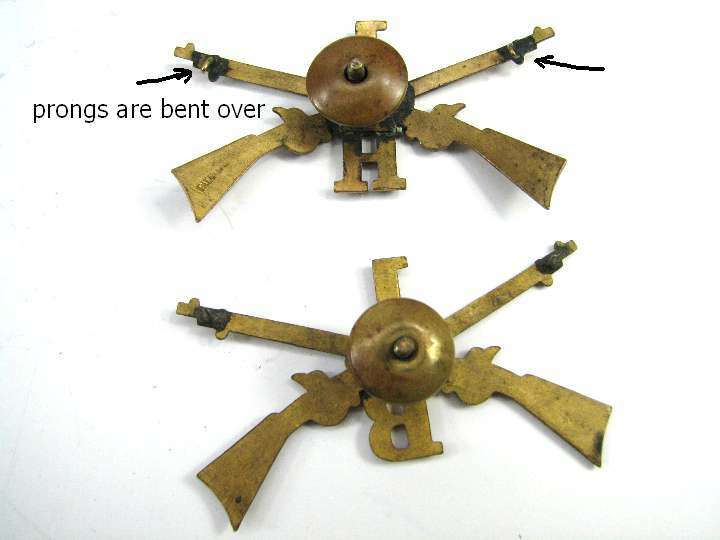 ADJUTANT GENERAL COLLAR DISKS: Clutch nuts included. Two piece construction can be disassembled for cleaning. With clutch nuts. Two piece, can disassemble for cleaning. 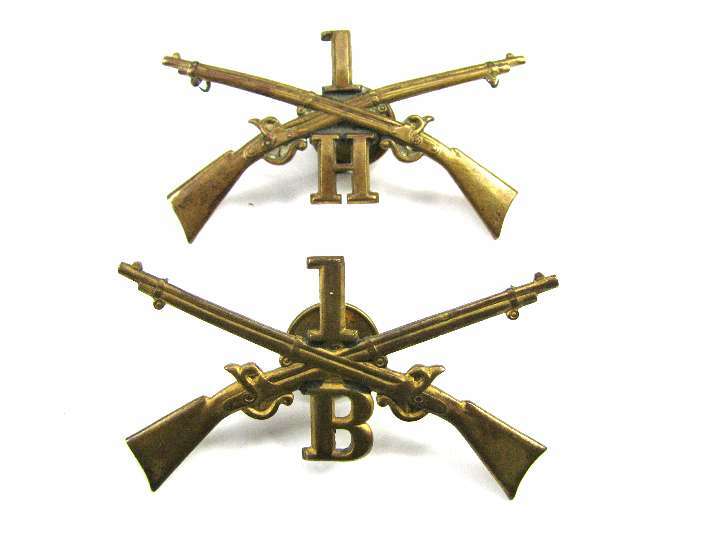 6th ARMY, "BORN TO WIN" DISTINCTIVE INSIGNIA SET: Three pieces (lapels and cap). N.S. Meyer hallmark. With nuts. 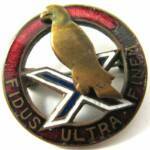 U.S. AIR FORCE: One pair silver tone pins for the lapels of an USAF uniform. 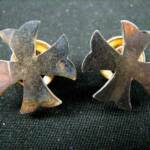 Finish is worn and tarnished. Measures about 13/16" X 7/16" with the period. Includes the clutch nuts. 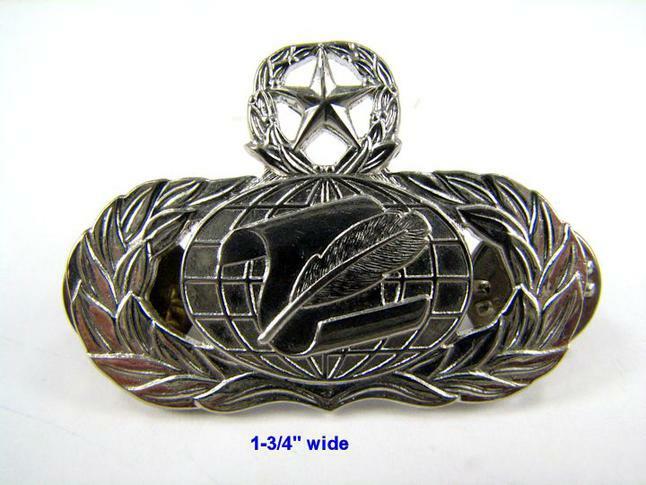 U.S. AIR FORCE: One pair silver tone pins for the USAF uniform. Finish is worn and tarnished. Measures about 13/16" X 7/16" with the period. Includes the clutch nuts. 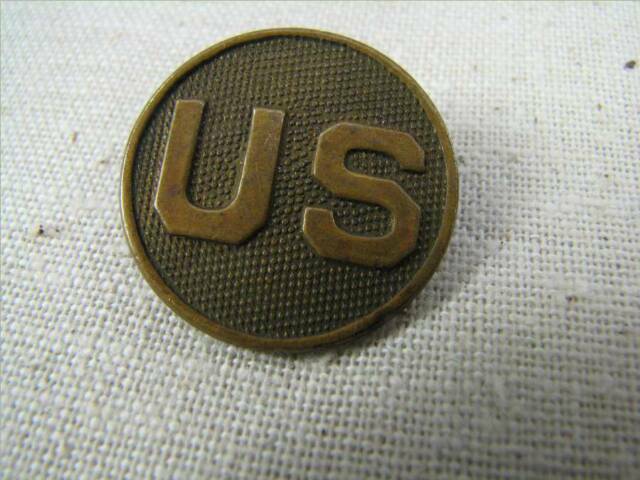 WW2, USAAF FLIGHT OFFICER PIN: Single 1" pin for the overseas cap. No back marking. Retaining rolling lock on the pin catch is broken. Still should pin on OK. UNUSUAL VARIATION, WW2 USAAF DISK: This disk is the normal, about 1", size. The winged prop is attached to the disk in a way different from usual. It also is a pinback with the pin being at the top....perhaps 'in-Country' made for the overseas cap or perhaps sweetheart pin?? 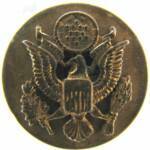 UNUSUAL VARIATION, WW2 LAPEL PIN: This U.S. pin is a stamped out metal instead of a solid metal like usually seen. I am thinking theater made. The clutch nuts are flat face STERLING. Pin measures 13/16" X 7/16". Single, not a pair. DUI FOR 1st ENGINEERS BATTALION: Marked S-21 on the back. Enameled surface looks good with no paint loss. WW2, WARRANT OFFICER "RADIOMAN", STERLING SILVER: Marked on the back "1/20 10K GP on STERLING". Some of the gold plate finish is worn off the front exposing the silver. The nuts with it are the early "flat faced" type and one of them is Sterling Silver. Measures about 7/8" wide by 1/2" high. 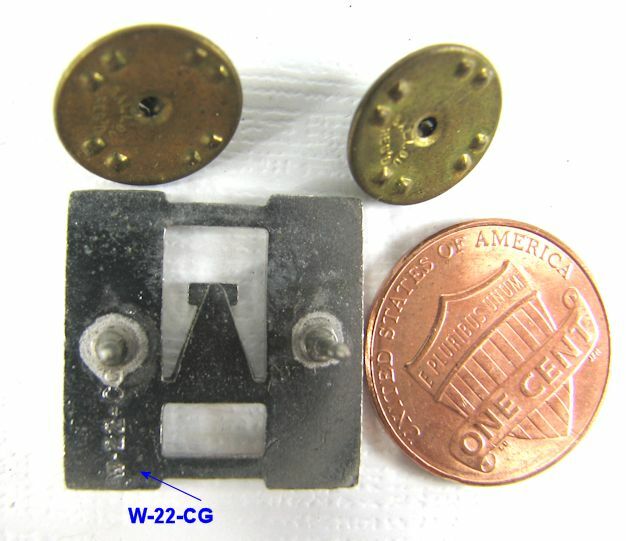 WW2 FINANCE CORPS COLLAR DISK: Complete with screw nut. I believe these date from the Korean War era. They are a high domed disk measuring about 1-1/16" in diameter. They are chrome plated. Some of the plating has flaked on the "U.S." disk. They are so shiney they are hard to photograph and the camera can be seen in the reflection. 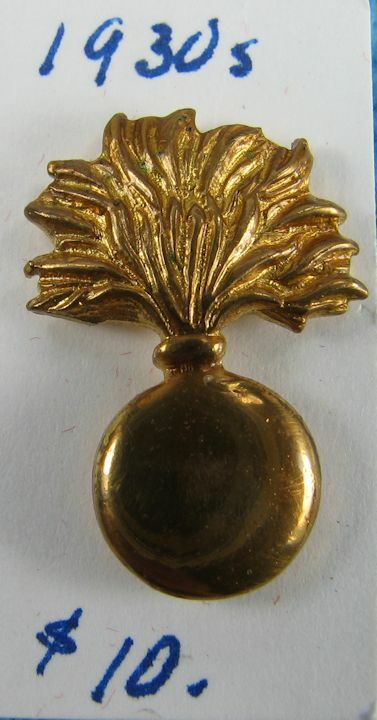 METAL INSIGNIA: Gold tone. About 7/8" wide and 1-3/8" high. I have others available. Item # 217007 $1.00 pair. Blackened. About 7/8" wide by 1-5/16" high. I have others available. WW2, USMC EGA: For Garrison cover or Collar. Fluted WW2 style nut. USMC, EGA FOR BILLED HAT: This is the larger sized EGA. Time period is unknown. 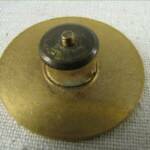 Brass nut and washer. 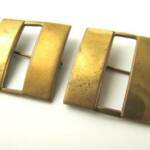 WW2, USMC COLLAR EGA: Great wear pattern to this collar device with the WW2 type fluted nut. 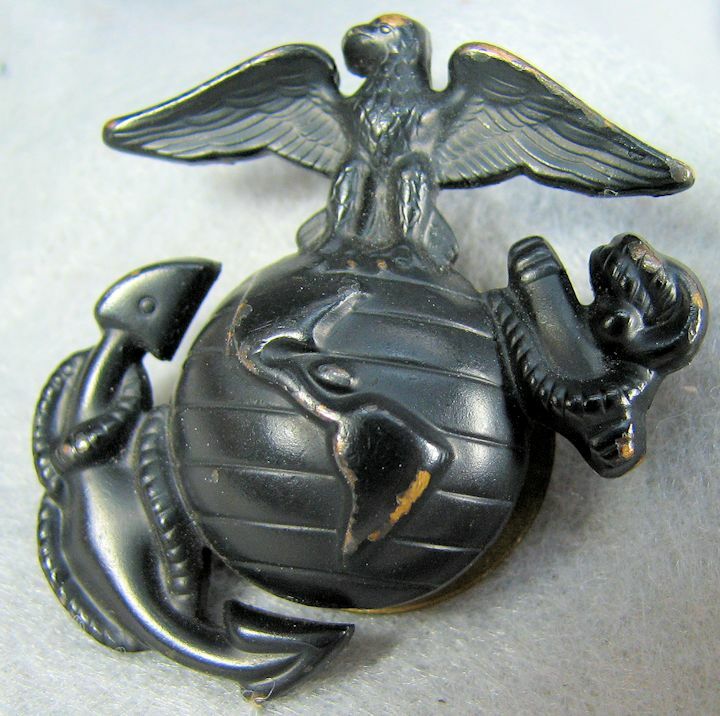 WW2, USMC EGA: This is for the collar or the garrison cap. WW2 type fluted nut. The screw stud is bent. 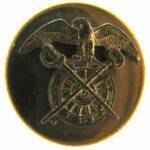 USMC EGA: For the garrison cover or the collar. Clutchback with the nuts. Gun metal gray? Time period unknown. 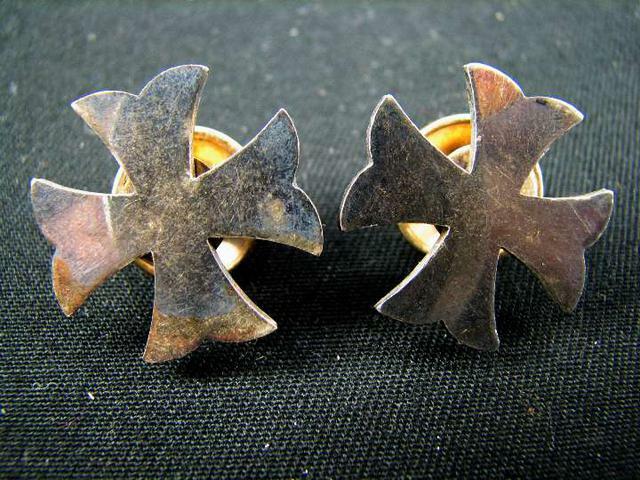 USMC EGA PAIR: Set of gun metal gray EGA for the collar. Clutchback. Time period unknown. 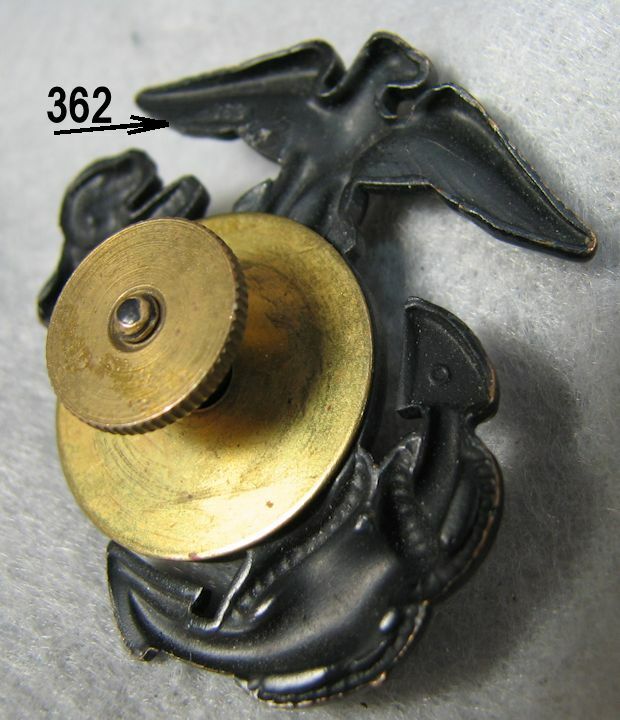 USMC EGA, LARGE: Billed cover size, screwback with brass washer and nut. Gun metal gray (? ) finish is "spotted". Time period unknown. 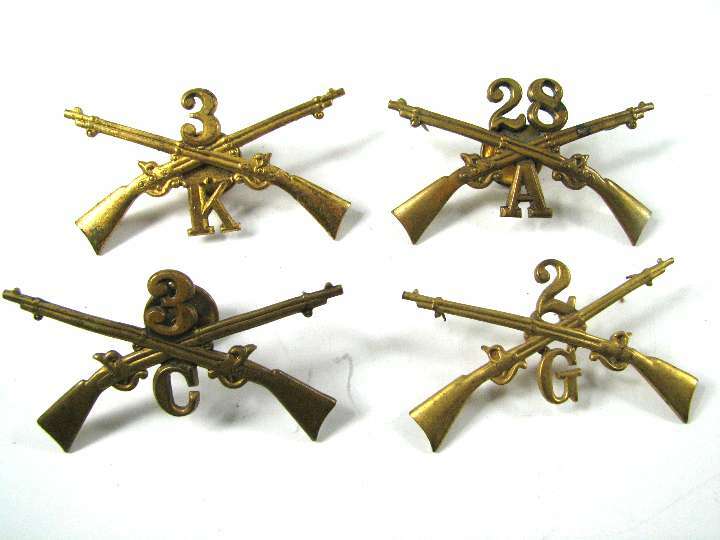 US NAVY/USMC RANK INSIGNIA: Small size for the garrison or overseas cap. Measures 5/8" square. Navy Lt. or USMC Capt. No back markings. With the nuts. MEDIC COLLAR DISKS: Probably Vietnam era or later. Two piece construction with the clutch nuts. Appear to be new and unused. Price is for one disk. Item # 317010 $2.00 ea. USMC EGA SET: Large piece for the billed visor cover and the two collar pieces. I believe not too old. All are screwback and one of the collar EGA screw studs is bent. 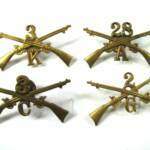 U.S. ARMY CAPTAIN'S INSIGNIA SET: Three pieces, all are flat and they are the smaller 3/4" size. Made by N.S. MEYER, NEW YORK. Two of the clutch nuts are silver colored, the other 4 are brass color. Two different makers of the nuts. 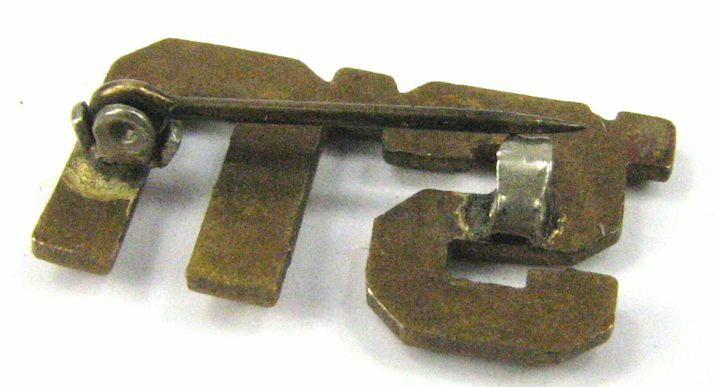 m1896, SPANISH-AMERICAN WAR, OFFICER'S HAT DEVICE: Nice screwback pin for 2nd Infantry Officer's hat. 2-1/4" X 1-1/4". UNKNOWN ORDNANCE INSIGNIA: Large flaming bomb measuring 1-1/2" X 1-1/8". Without the flame the round piece is 1" diameter. Silver tone color and non-magnetic. On the back are two loops to be used to sew on the insignia. As large as it is I would say it is a Kepi or Hat device. I have not been able to find one on the 'net like it. 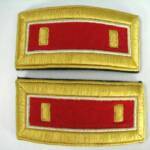 U.S. ARMY ORDNANCE CAPTAIN SHOULDER BOARDS: One pair of shoulder boards with white Captain bars, red field with gold border. 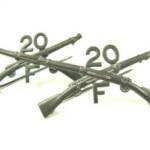 I believe Ordnance Branch. Unknown maker. Will date Vietnam War or later. U.S. ARMY ORDNANCE LT. COL. SHOULDER BOARDS: One pair in the original, now opened, packaging. 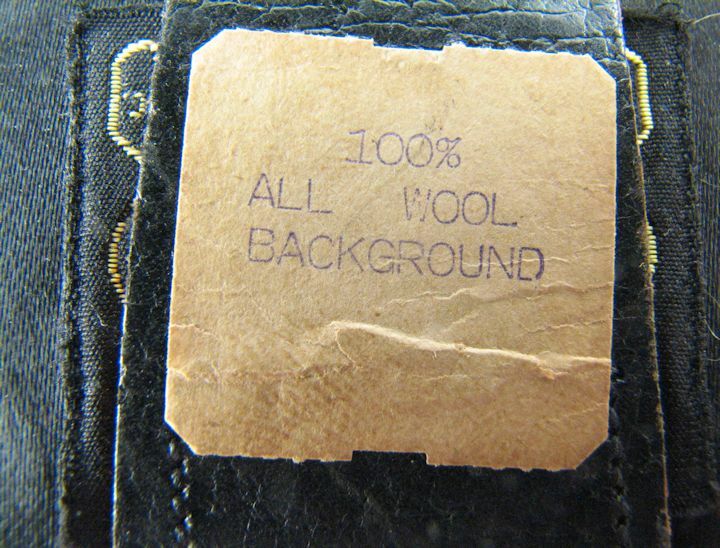 On the package the maker is "IRA GREEN INC.". Also on the package is "ORD" which I will assume is for "ORDNANCE". These will date Vietnam War or later. 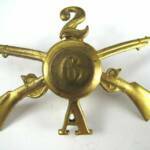 DISTINCTIVE UNIT INSIGNIA, 20th ASG: One unmatched pair of DI for the 20th ASG. The 20th AREA SUPPORT GROUP were based at Taegu, South Korea. One of these "Arsenal For The Brave" DI's was made by "D-22" and the other is "N.S. MEYER". There are no clutch nuts with them. They measure about 1-3/16" X 1-3/16". I believe they will date Vietnam War era. Lots of Agent Orange illnesses from this unit. 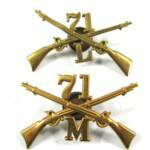 DISTINCTIVE UNIT INSIGNIA, 20th ASG: One matched pair of DI for the 20th ASG. The 20th AREA SUPPORT GROUP were based at Taegu, South Korea. Both of these "Arsenal For The Brave" DI's were made by "N.S. MEYER". There are no clutch nuts with them. They measure about 1-3/16" X 1-3/16". I believe they will date Vietnam War era. Lots of Agent Orange illnesses from this unit. 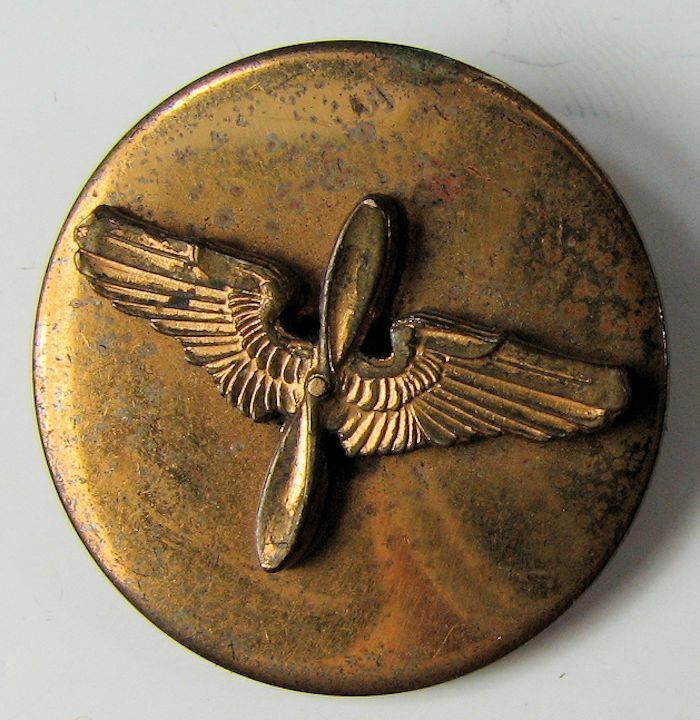 U.S. ARMY AIR CREWMAN WINGS, 2": Clutch back with the nuts. Made by NS MEYER and marked "9M" in a shield. They look good. 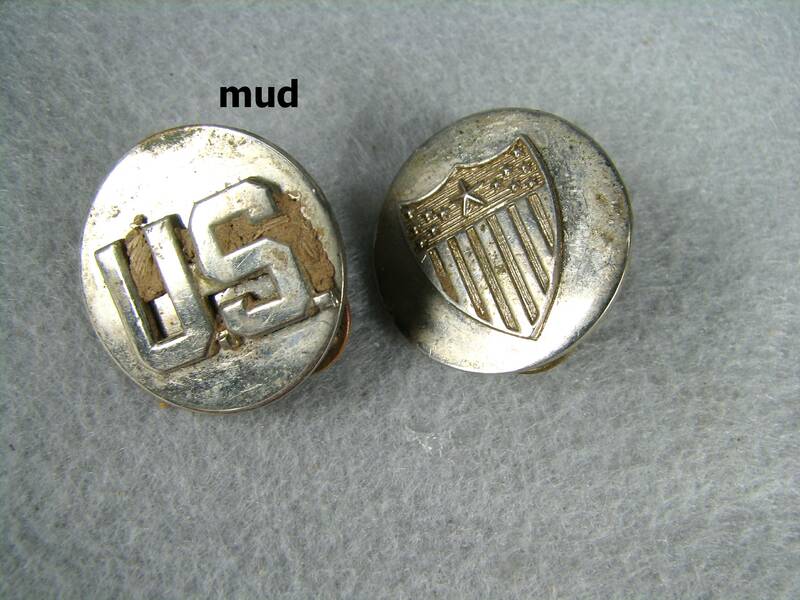 U.S. LAPEL PINS: Newer made silver-toned pins marked "G-23". 3/4" X 7/16". DUI, 7th INFANTRY, 32nd REGIMENT: Lots of casualties from this unit in the Korean War. Clutchback with the nuts. ROTC CADET MAJOR PIN: It is shiny, chrome color metal. 1-1/4" X 3/4". Clutchback with the nuts. 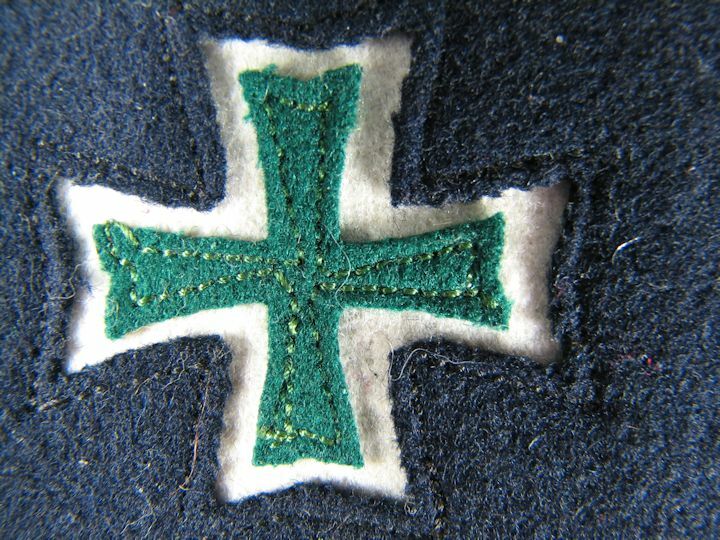 Marked on the back GI and then an unknown symbol. 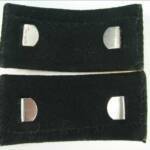 AIRBORNE JUMP WINGS, STERLING: Full size, 1-1/2" wide. No back mark other than "STERLING". 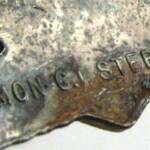 Canopy lines are missing either from a variation stamping or more likely they have been worn off. Clutchback with the nuts. 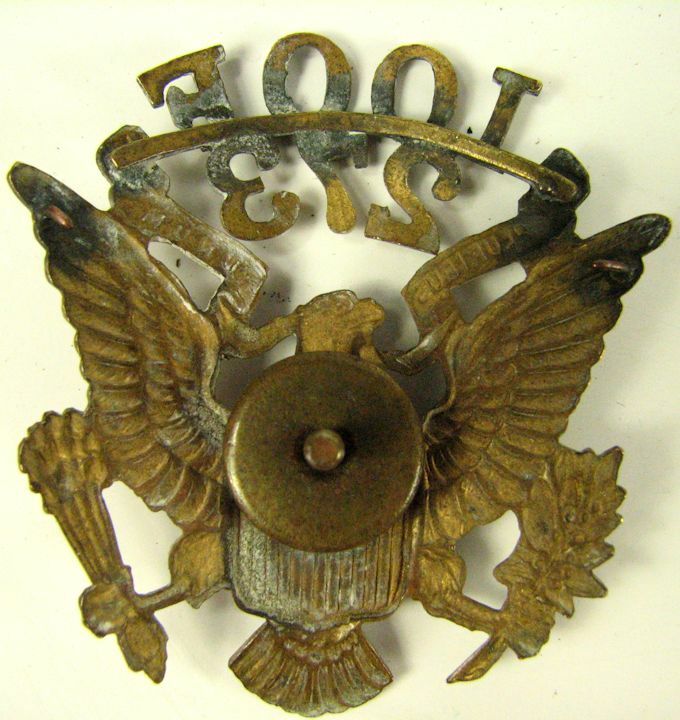 ROTC HAT BADGE: Made by GEMSCO, N.Y. Screwback with the nut. About 2-1/4" X 2-1/4". 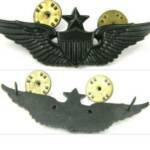 U.S. ARMY PILOT WINGS, STERLING. SHIRT OR SWEETHEART SIZE: They measure about 1-5/8" wide. They are sterling silver with the "ING" visible on the back under the pin. They are pinback. I believe they are WW2 period. 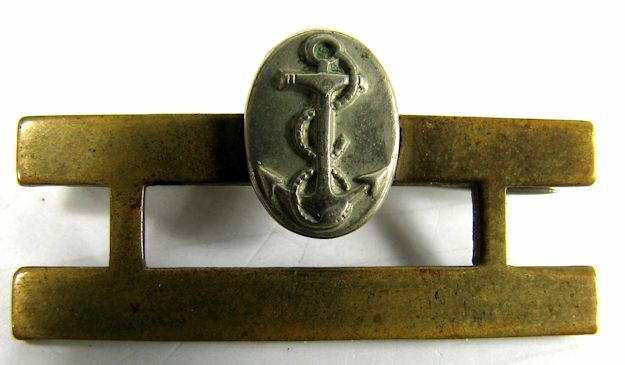 SHOULDER BOARDS, MEDICAL CAPTAIN: In the original package. Package has been opened and then closed and stapled. I will assume they were removed to put on a uniform and then returned to the package. Or someone may just have wanted them out of the package to look at them. I have not had them out so do not know what is on the backside. The packaging is for N.S. MEYER, INC.
407th REGIMENT, 102nd INFANTRY DIVISION. 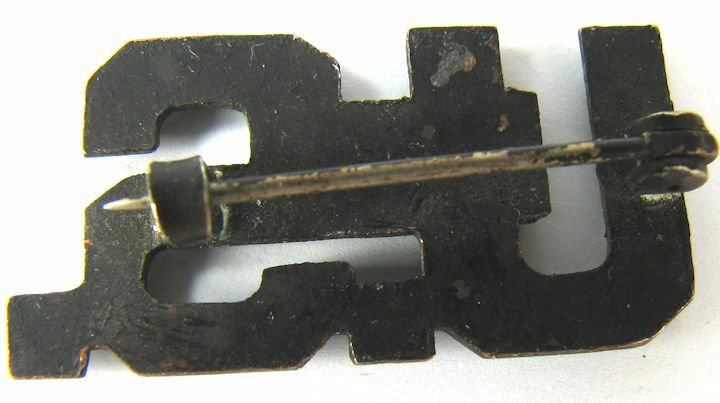 LAPEL PIN: Marked "Acid Test". 2" size. 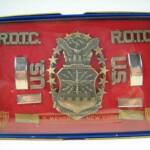 U.S. ROTC LAPEL PINS: Pair of ROTC uniform lapel insignia. Nuts are threaded type. About 13/16" X 1/2" in size. 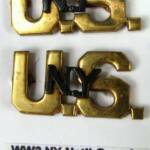 US NAVY WINGS FOR OVERSEAS CAP, H-H LOGO: Small set of gold-tone wings to be worn on the right side of the USN overseas/garrison cap. 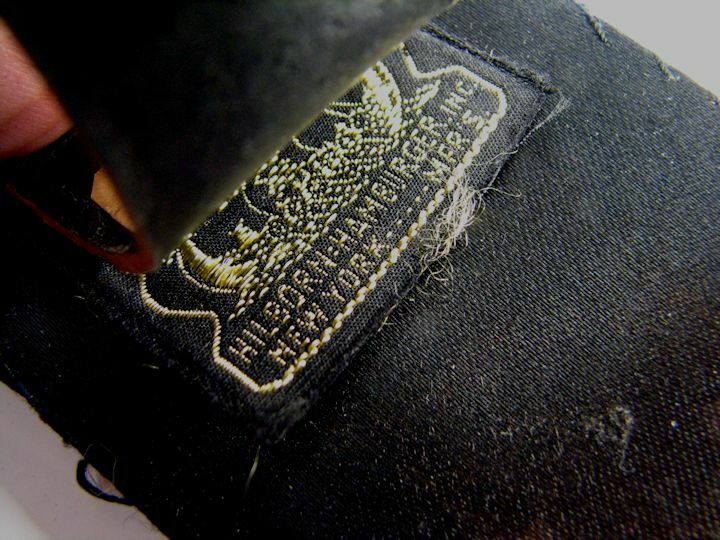 Hallmarked H-H (Hilborn-Hamburger). ARMORED CAVALRY, U.S. DISKS: Korean War period. Clutchback. 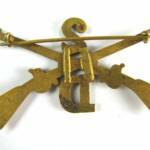 COMBAT INFANTRY BADGE: Hallmarked "N.S. MEYER INC., NEW YORK". Nice. "OLD IRONSIDES" ENAMELED PIN: Marked "SUSCO S-21". clutchback with the nuts. 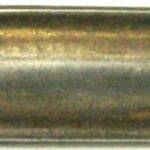 About 1-1/4" X 1-1/4". 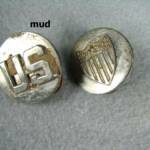 UNITED STATES NAVY OFFICER'S OVERSEAS CAP PIN: I believe it is older, possibly WW2. 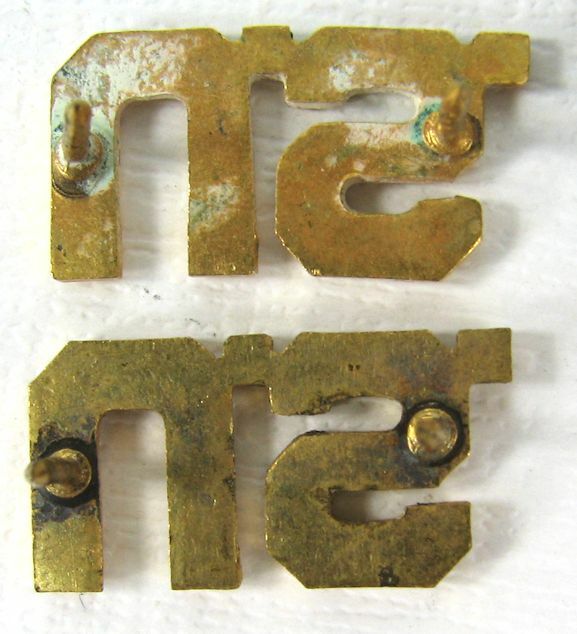 It is two piece construction held together with 2 "studs" (see photos). It is Hallmarked: "N.U.S." for NAVAL UNIFORM SUPPLY. 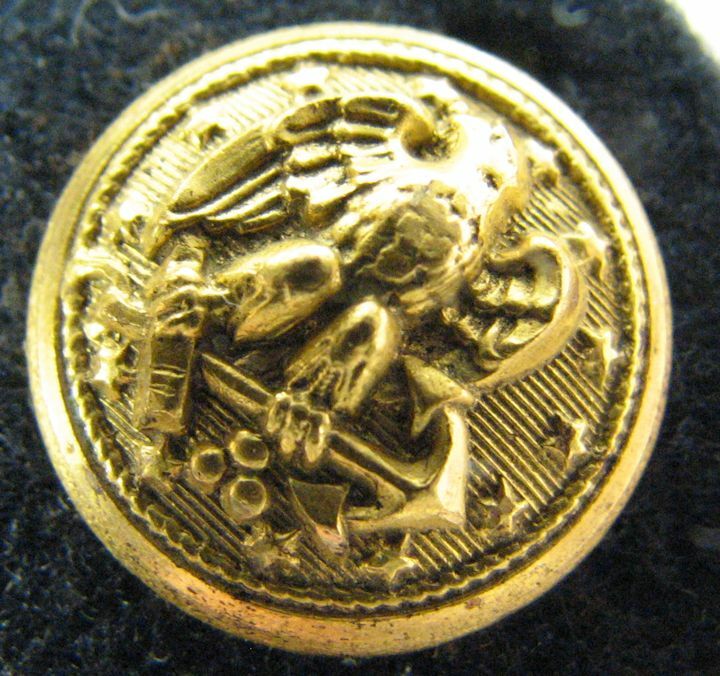 Marked also as "1/20 10KGF & STERL", so the eagle and shield are Sterling and the anchors are gold fill. 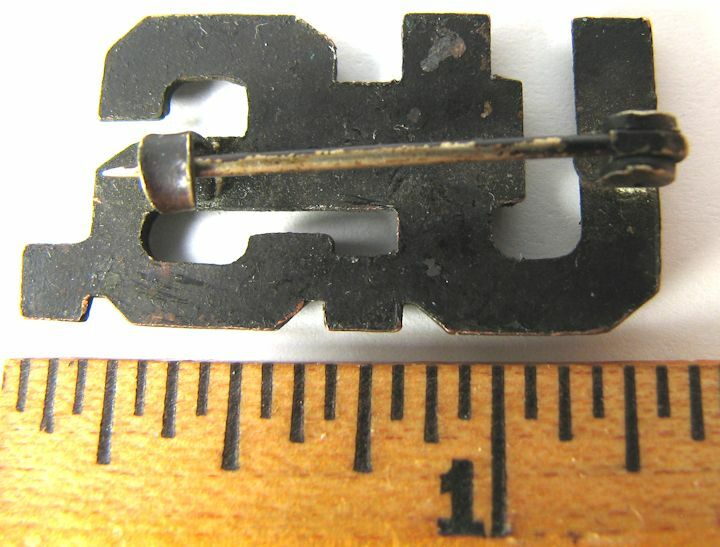 It is pin back and measures about 1-1/4" square. Nice looking pin. 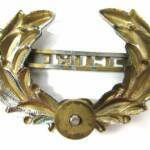 WW2 NAVAL AVIATION CADET PIN. FIRST CLASS: Worn over the left breast pocket. 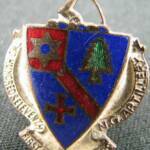 Hallmarked N.S. Meyer. 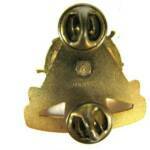 Pin back fastener. Measures about 1-1/2" X 3/4" overall size. Not a common item. 2nd LT. 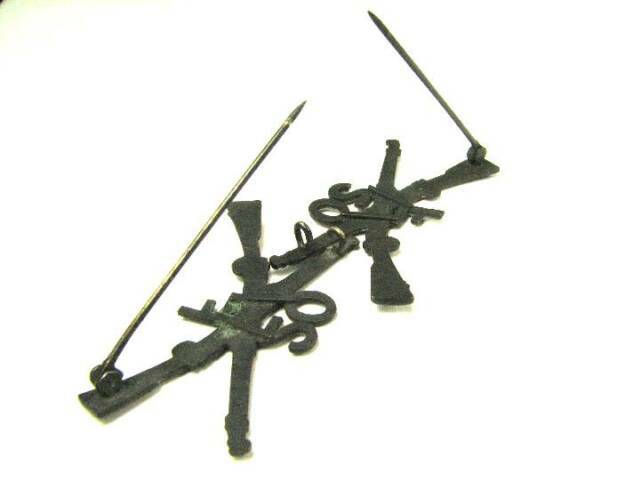 SHOULDER BARS: Marked as 1/20 Silver Filled and "S21". Few surface scratches. Nuts included. DI, 57th MEDICAL BATTALION. PINBACK, N.S. 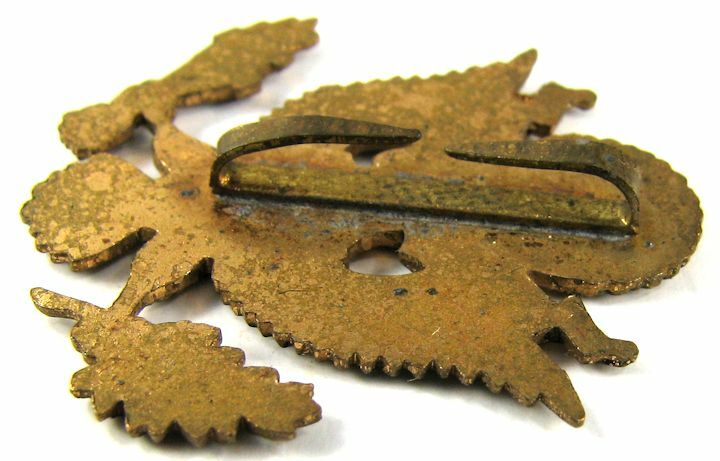 MEYER: This Distinctive Insignia has a hallmark of N.S. Meyer. It is a pin back. It measures 7/8" X 1-1/8" in size (size text on the photo is wrong). There is finish wear to the center surface. 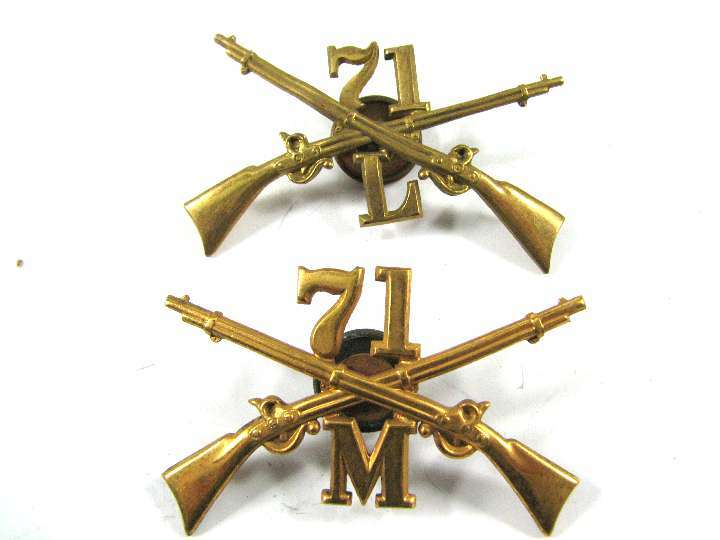 U.S. COLLAR/LAPEL PINS: This pair of U.S. clutchback insignia match in appearance being same size and shape but one of them is back marked "ACID TEST". They measure about 13/16" wide and 7/16" high. Clutch nuts included. 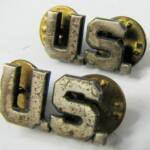 U.S. COLLAR/LAPEL PINS: A pair of matched U.S. pins complete with the Flat Face clutch nuts. They measure about 13/16" wide and 7/16" high. 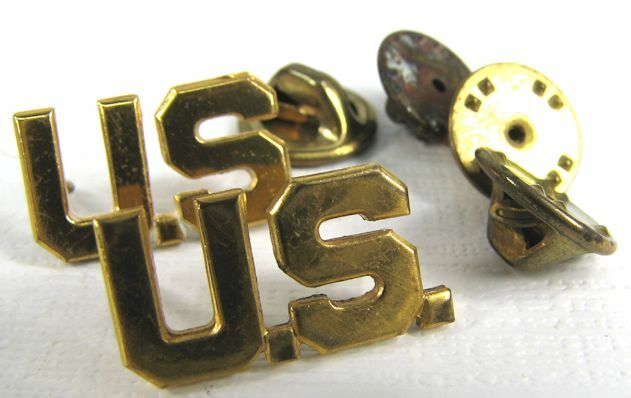 U.S. COLLAR/LAPEL PINS: A pair of matched U.S. pins complete with the clutch nuts. They measure about 7/8" wide and 7/16" high. 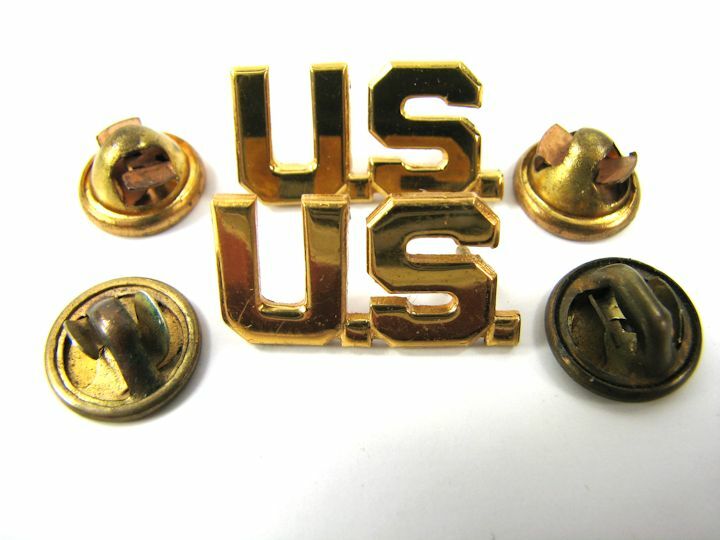 U.S. COLLAR/LAPEL PINS: A pair of matched U.S. pins complete with the clutch nuts. They measure abut 13/16" wide and 7/16" high. 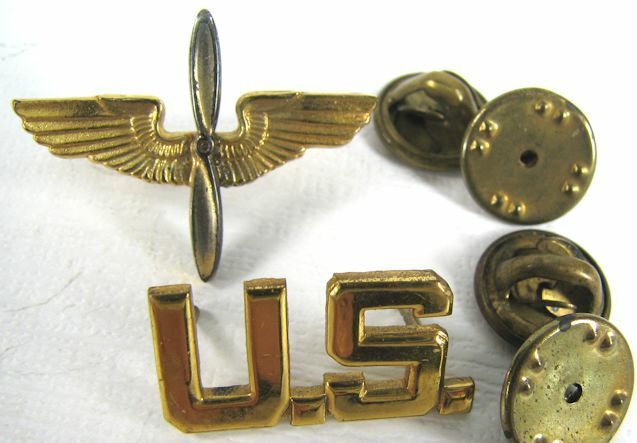 WW2, U.S. ARMY AIR FORCE COLLAR/LAPEL INSIGNIA: The winged prop measures about 1-1/8" wide and 13/16" high. 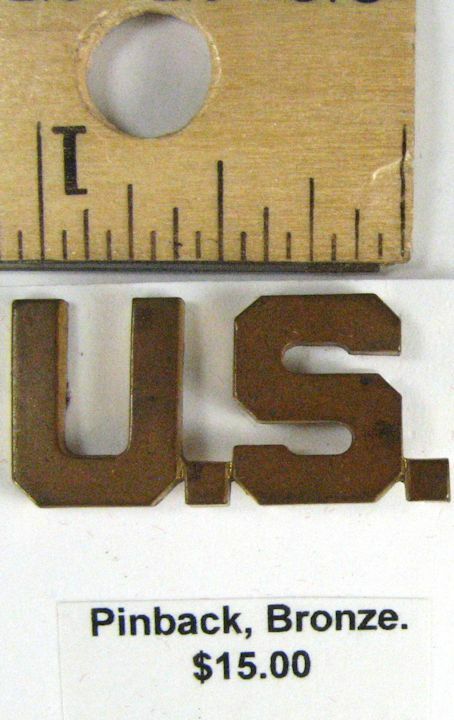 The U.S. is about 7/8" wide and 7/16" high. Both have the snowflake backs and the U.S. is marked ACID TEST. Clutch nuts are included. 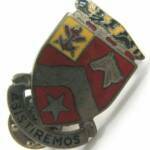 DUI, 5th QUARTERMASTER BATTALION, SUPPLY AND TRANSPORT: Pin back with N.S. Meyer hallmark. Chip at the bottom of the red diamond. 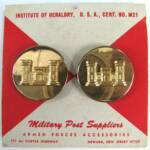 DUI, FIELD ARTILLERY REPLACEMENT TRAINING CENTER: Pin back, N.S. Meyer hallmark. 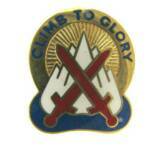 PIN, 2nd INFANTRY DIVISION: Pin back. No hallmark. DUI or just a pin??? 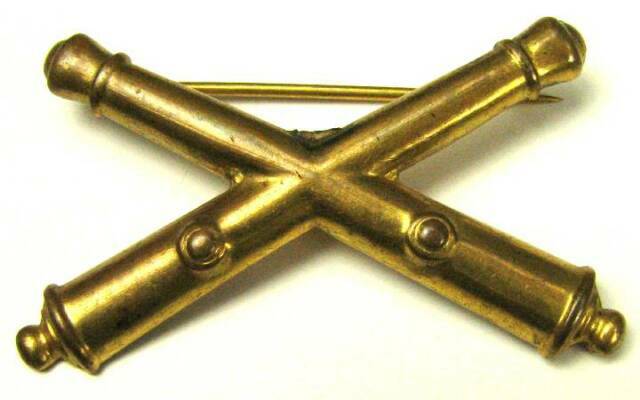 DUI, 43rd FIELD ARTILLERY: Pin back, no hallmark. 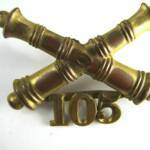 DUI, 15th FIELD ARTILLERY: Pin back, no hallmark. DUI, 15th FIELD ARTILLERY: Clutch back. Nuts included. MADE IN USA and P23 marked. My camera reflection is on it. DUI, ARMY AIR FORCE GULF COAST TRAINING CENTER: Pin back, no hallmark. 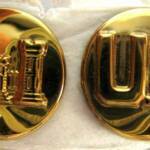 DUI, CALIFORNIA CADET CORPS: Pin back, no hallmark. 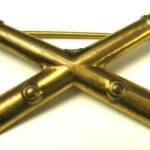 COLONEL LEFT LAPEL INSIGNIA: Clutchback with the nuts. 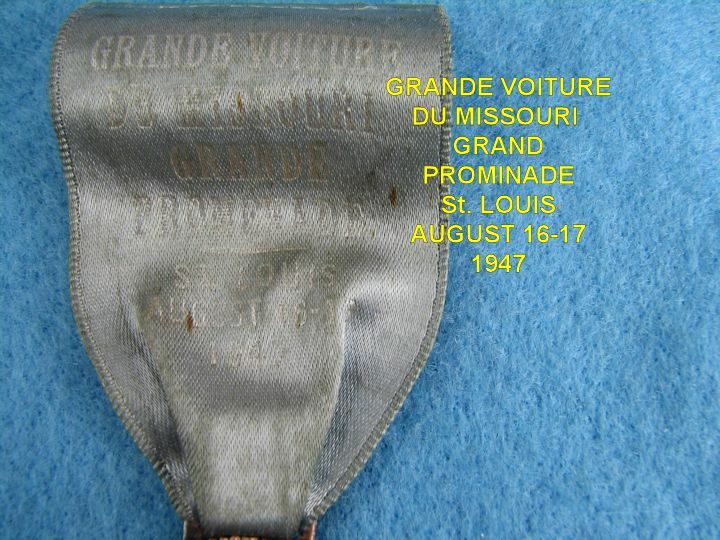 Back marked "TN G.I.". 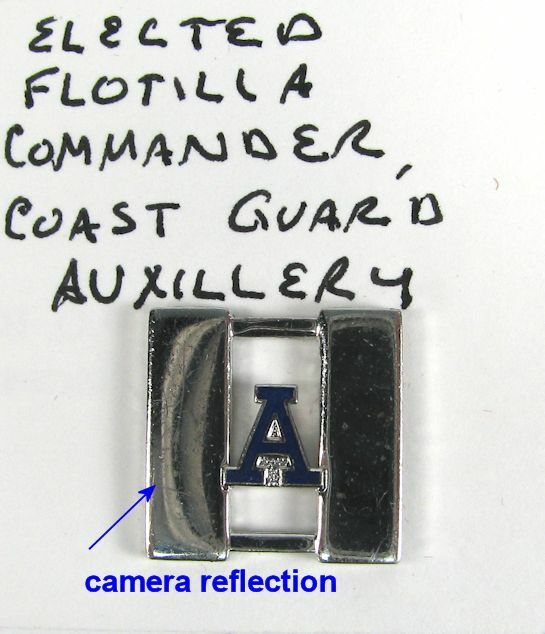 COAST GUARD AUXILLERY, FLOTILLA COMMANDER: Clutchback with the nuts. Back marked TN G.I. Single piece.